Meticulous, Loves Optimizing eCommerce Stores. Google Certified Adwords & Analytics Individual. My superpower is Optimizing Magento Stores! 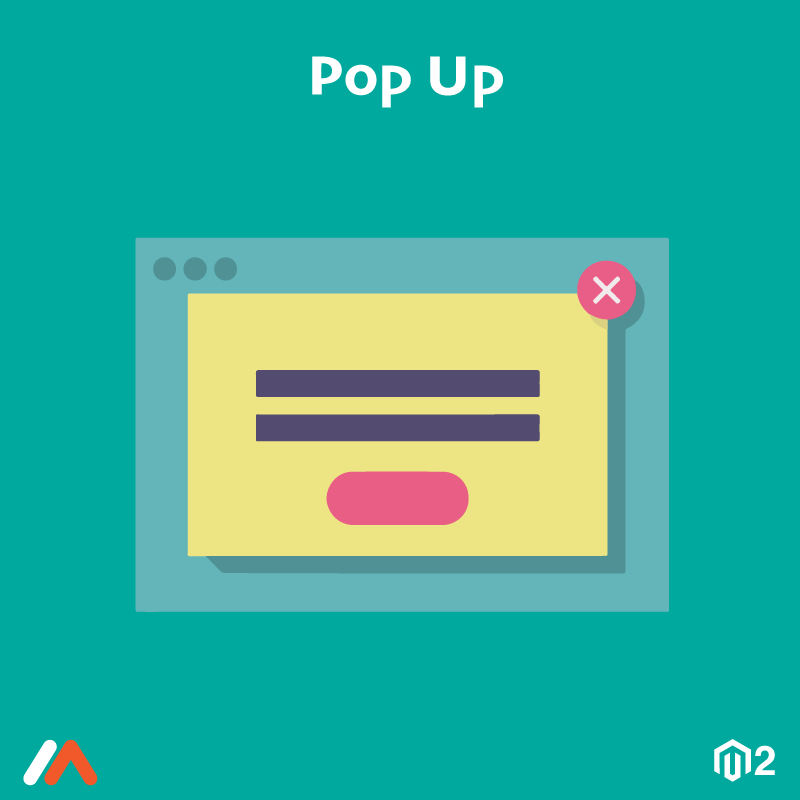 Magento 2 Pop Up by Meetanshi helps draw customers' attention with attractive popups. Popups in web pages are one of the E-commerce tactics to increase conversion! For Magento 2 stores, Meetanshi has developed Magento 2 Pop Up extension that generates attractive popups to grab visitors attention. Promote your products, increase the newsletter subscribers, promote an offer, increase your social media engagement! Everything with custom popups powered by attractive animation effects. Display a popup with CTA image link, contact form, subscription box, videos, product widget, etc. with Magento 2 Pop Up extension. Grab the visitors attention at the right time and boost the conversion rate! •	Generate various popups such as an image with CTA link, videos, banners, product widgets, contact form, subscription box, and promotional message. •	Display custom popup based on the users' behavior like after he spends a definite amount of seconds on the page, after the page is scrolled by a certain percent, immediately, etc. •	Show the popups on different store pages like home page, category page, product page, cart page, checkout page, etc. •	Custom showcasing of the popups based on customer groups and the store views. •	Display popup for a fixed date range. •	Option to auto-close the popups after fixed seconds. •	Generate responsive popups for desktops, mobiles, and tablets. Site speed directly affects the user experience of Magento 2 store. It can't be neglected as visitors expect the unhindered user experience else bounces to other sites! 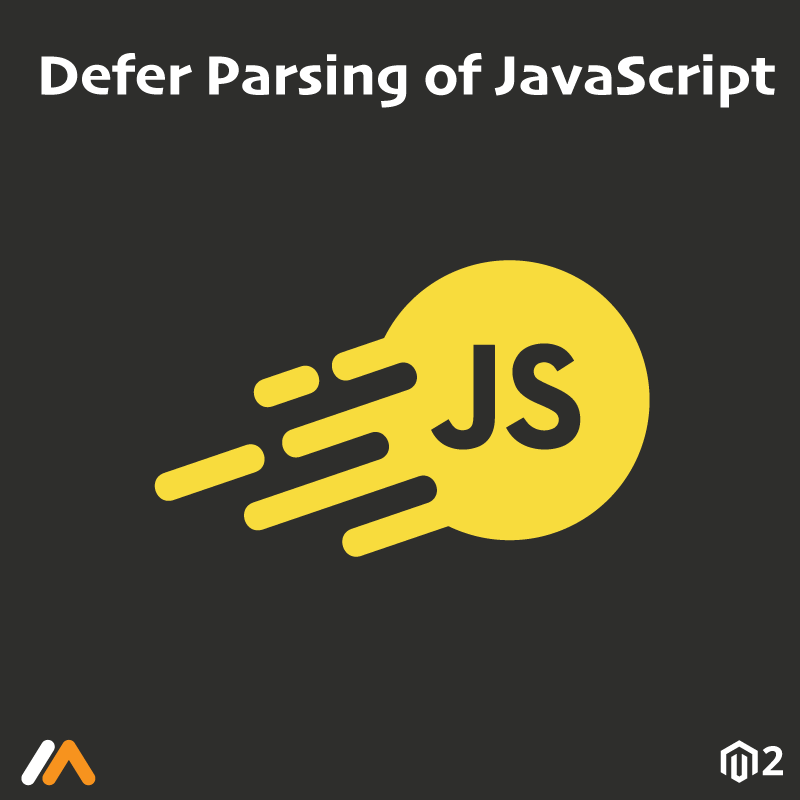 •	Defer parsing until the last moment to improve the load time. •	No more issue of the full page cache. •	Increased rendering time improves the Google Page Speed score. Magento Payment Gateway Integration Service by Meetanshi offers to integrate any payment gateway to your Magento 1 or Magento 2 store. Secure money and data transfer are at the center of online payments. A payment gateway is responsible for carrying out the online payment process in such a way that does not breach the security. For Magento 1 and Magento 2 stores to capture payments online via internet, integrating a payment gateway is a must. 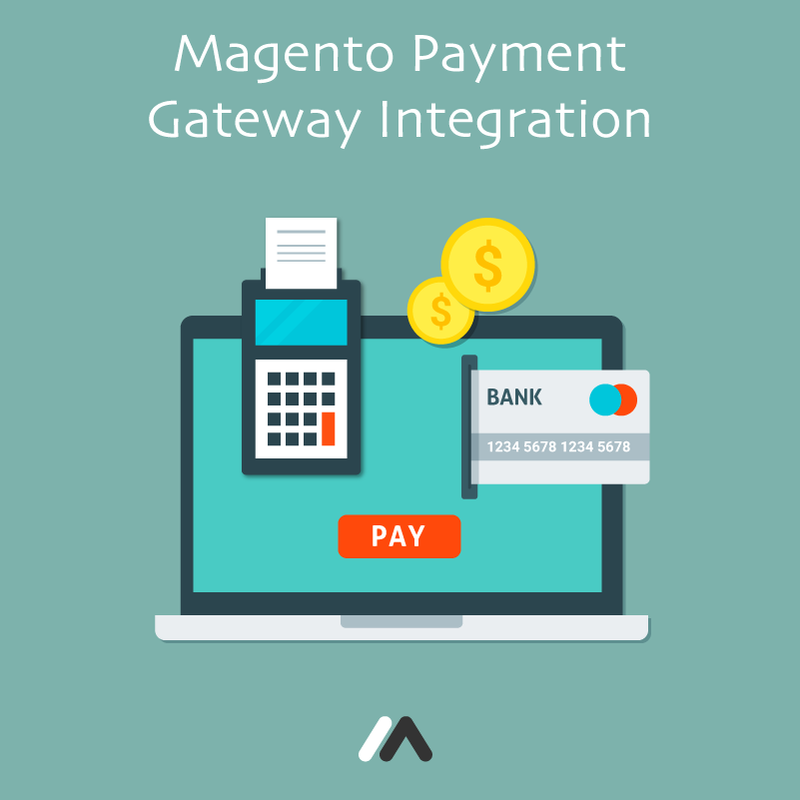 Integrate any preferred payment gateway with your Magento 1 or Magento 2 store to capture secure online payments with Meetanshi's Magento Payment Gateway Integration Service. The payment gateway integration can be a complicated process that requires an expert's attention. The certified developers at Meetanshi guarantee errorless and seamless payment gateway integration without any data loss or flaw in the store's security! •	Magento certified developers to offer you the service. •	Offer customers a secure platform to shop online. •	Integrate any payment gateway with your Magento 1 or Magento 2 store. •	The service can also be selected for custom payment gateway implementation. •	Offer multiple payment modes. •	Offers hosted payment gateway for security against thefts. •	The API uses encrypted data on the website. •	Direct and quick refund option. •	Supports Visa, Mastercard, American Express and Diners Club. •	Easy to use module. •	Easily manage the payment, refund, and cancellation process. 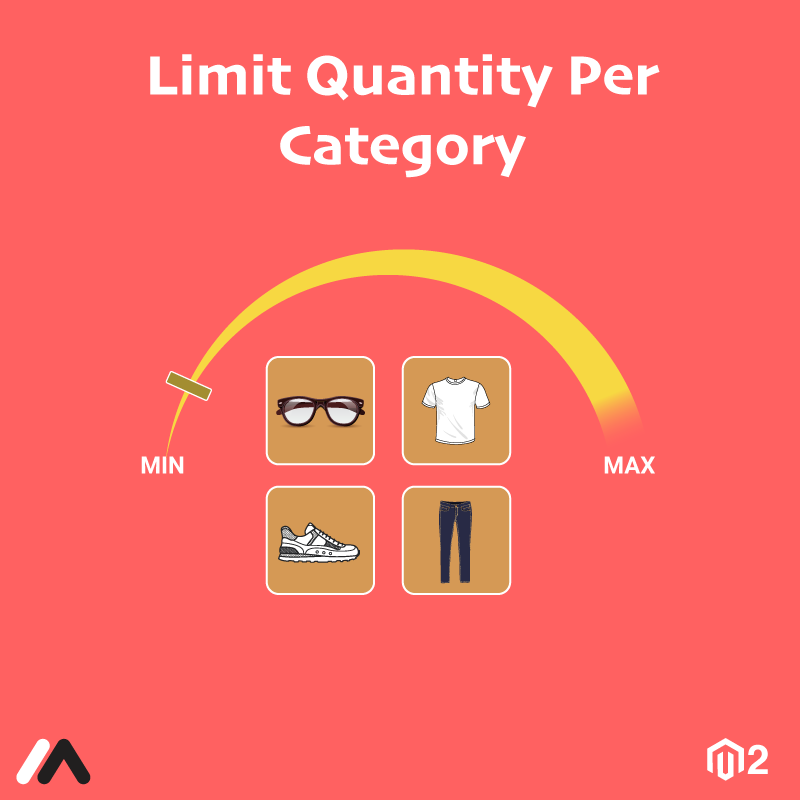 Magento 2 Limit Quantity Per Category by Meetanshi allows admin to set a minimum and maximum quantity condition per category for every customer group. Magento 2 store owners look for various tactics that maximize the profit margin. The online stores must have a cost-effective shipping and packaging strategy. To help with it, Meetanshi has developed Magento 2 Limit Quantity Per Category extension. Set the conditions for minimum and maximum quantity ordered per category for every customer group. Overcoming the default limitation, restrict the checkout when the conditions set by the admin are not met, with a notification message. •	Limit quantity per category for every customer group to checkout successfully. •	Show the category name in the cart. 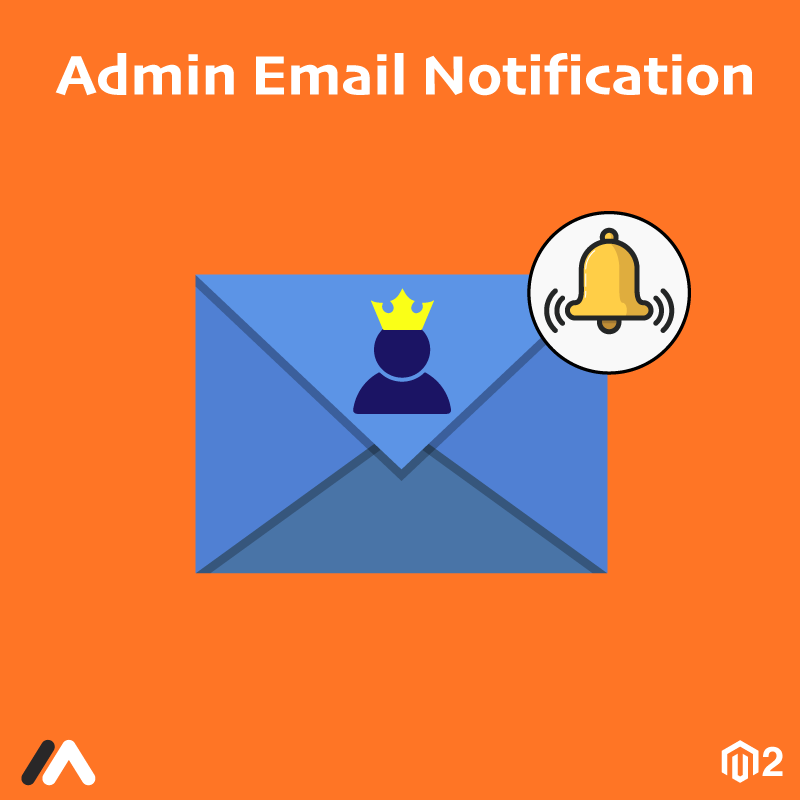 •	Show the notification message when the conditions set by the admin are not met instead of the checkout button on the frontend. •	All the conditions for minimum or maximum quantity should be met with for multiple category products. •	Cost effective shipping and packaging. 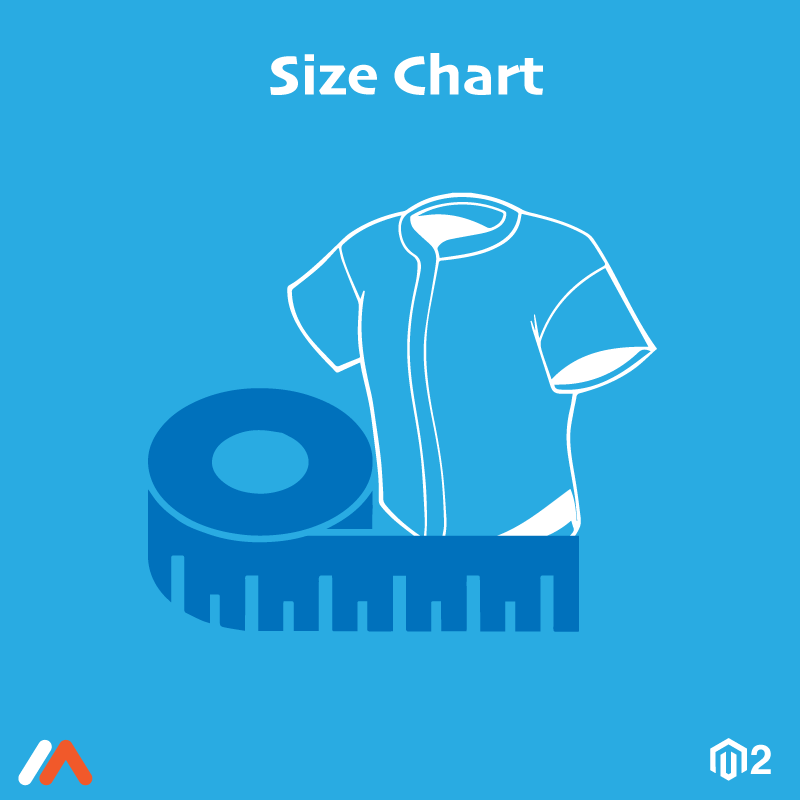 Magento 2 Size Chart by Meetanshi allows admin to offer customers the size charts for apparels, shoes, etc. that helps select the correct size and enhance the shopping experience. Taking into consideration the improvement of the shopping experience is the priority of Magento 2 store owner. Easier it is for the customers to find and choose the required product, more the conversion! Hence, Meetanshi has developed Magento 2 Size Chart extension. The Magento 2 Size Guide enables admin to create a unique and custom size chart for each product. It facilitates customers to decide the correct size of the wearable products. Add the size guide in the popup, product page or the product tab. Add unlimited size options in the guide! Use HTML editor to customize the design of the size chart and popup! Reduce the returns of clothes, shoes, etc. products with Magento 2 Size Chart extension. Improve the on-site shopping experience and boost the conversions! •	Offer attractive size guides for all the products in the store. •	Unique and custom size chart for each product. •	Admin can use the HTML editor to customize the design and size options. •	Offer the size chart on the product page, product tab, popup or the default position. •	Admin is allowed to edit content and update the icon for the popup link. •	Size charts can be assigned to products using the size chart attribute from the product edit page. •	Assign size chart to multiple products quickly using the rule condition from the admin panel. •	Assign the priority for multiple size charts added to a product. •	Easy for the customers to find the correct size. Magento 2 Import Export Newsletter Subscribers by Meetanshi offers the facility to import and export newsletter subscribers in bulk via CSV file. The newsletter subscribers data is important for marketing purpose and interaction with potential customers. However, the default Magento 2 does not support to import and export newsletter subscribers. Hence, Meetanshi has developed Magento 2 Import Export Newsletter Subscribers extension to overcome this default functionality. The extension facilitates to import and export newsletter subscribers in bulk via CSV file! Easily access the newsletter subscribers' list in a single click. 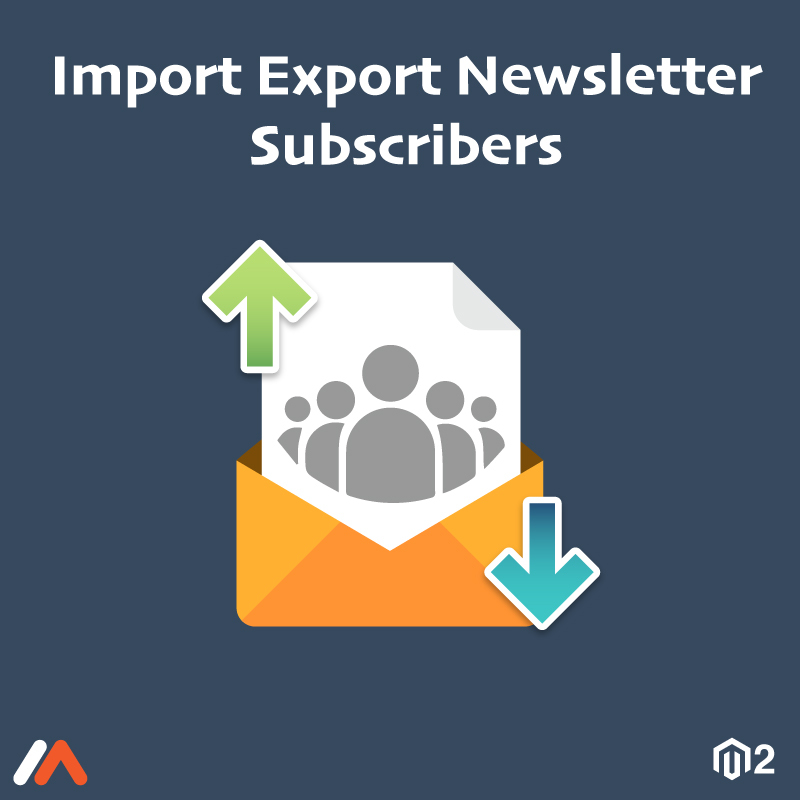 The Magento 2 Import Export Newsletter Subscribers extension is a time saver module for admin while migrating the data to Magento 2! 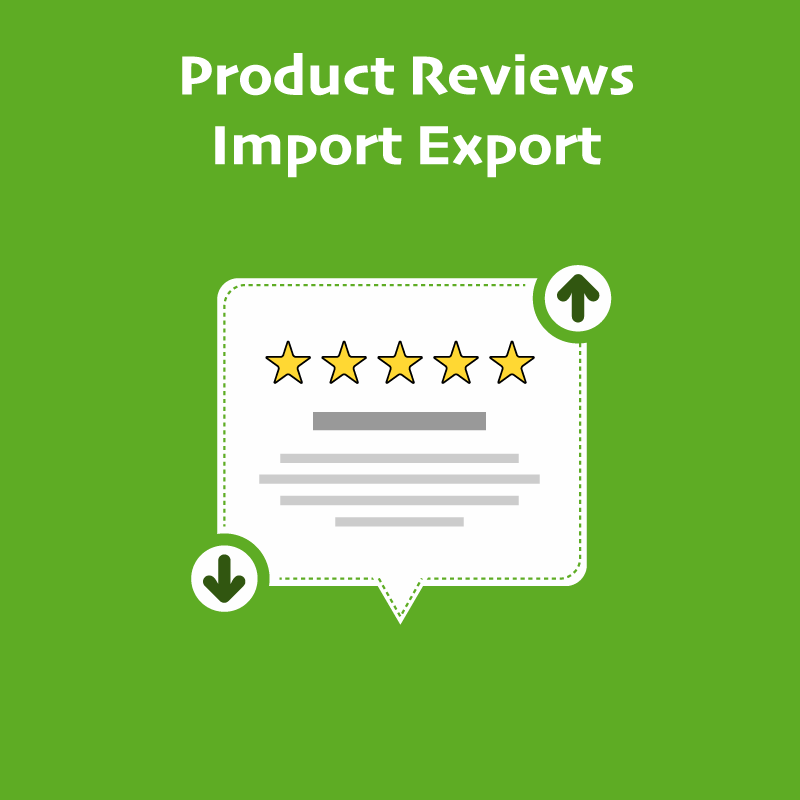 •	Bulk import and export newsletter subscribers via CSV file and thus saves time. •	Sample CSV file available to download and complete the data. •	Import guest customers who have subscribed for the newsletter. •	Allows to assign subscription statuses like Subscribed, Unsubscribed, Not Activated, and Unconfirmed. •	Get the list of newsletter subscribers in a single click. •	Useful to migrate data to Magento 2. 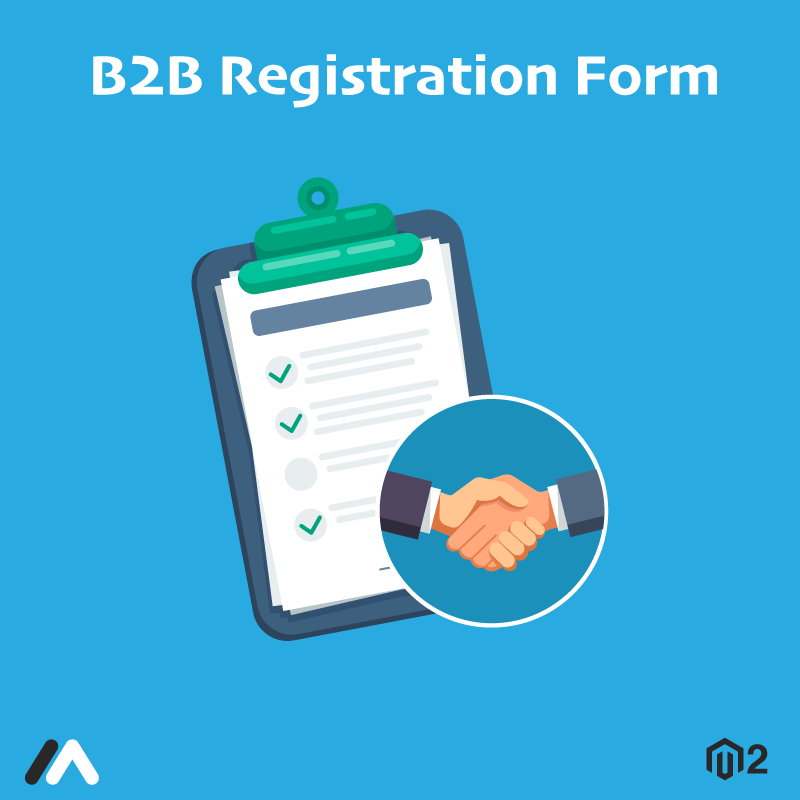 Magento 2 B2B Registration Form by Meetanshi offers a separate registration form for B2B customers and wholesalers. The default Magento 2 sign up form falls short when it comes to dealing with the wholesalers or B2B registration. To overcome this limitation, Meetanshi has developed Magento 2 B2B Registration Form extension. For the Magento 2 stores having B2B and B2C registrations, it is difficult to manage them at a time. Having a separate registration form for B2B accounts with additional fields like company name, VAT or TAX number, business type, etc. makes it easier. With Magento 2 B2B Registration Form module, the admin is notified when a new B2B sign up is performed. Admin has to approve the registration and the customer is notified of the same via an Email or frontend message. Simplify the B2B registration in the Magento 2 stores now! •	Enable a custom sign up form for B2B customers or wholesalers with fields like company name, tax number, etc. •	Approve or disapprove the B2B registration from the admin panel. •	Admin can enable/disable the default "Create an Account" form in the store. •	Notification for new B2B signup to the admin. •	Customers are notified via an Email and storefront message of admin's decision of approving or not their wholesaler's account. Magento 2 Cardsave Payments by Meetanshi allows secure online payments with the integration of Magento 2 with Cardsave payment gateway. Security in online payments decide the fate of your E-commerce business. Being the most important factor of the business, Magento 2 stores must ensure that a secure online payment platform is provided to the customers. To fulfill this motto, Meetanshi has developed Magento 2 Cardsave Payments extension. 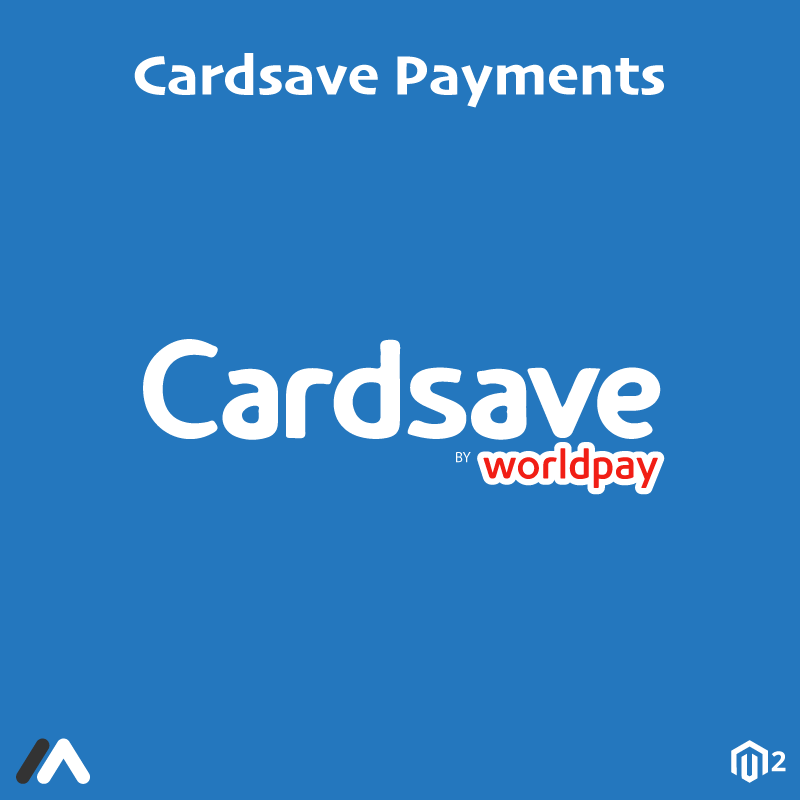 The extension integrates Magento 2 with Cardsave payment gateway. Offer safe and spam-free online payment facility with UK's popular Cardsave payment gateway. The Magento 2 Cardsave Payments extension offers two types of payment gateway integration: Hosted and Direct. The Magento 2 Cardsave Hosted Payments uses Cardsave's hosted payment page, where customers are redirected to enter the card details. Hence, it ensures better security! The Magento 2 Cardsave Direct Payments offers better customer experience by capturing the card details in the store itself. Admin can have the full control over the transactions in this method! •	Use hosted payment page for secure online payments. •	Allows custom title for the payment method in the store. •	Integrate the gateway using the payment gateway URL domain obtained while registration. 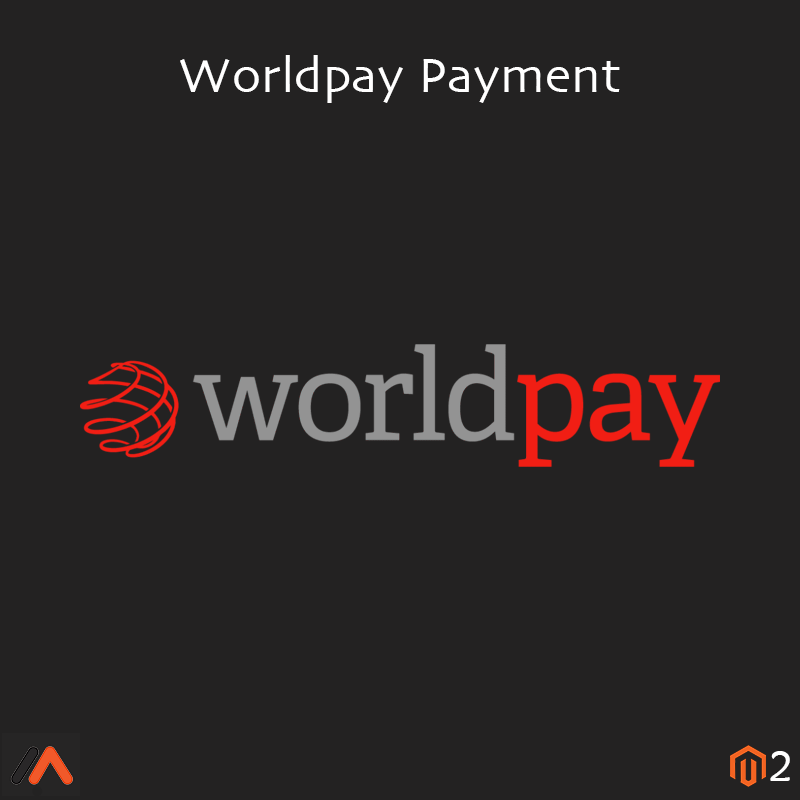 •	Option to enable or disable the Worldpay logo in the frontend. •	Use Merchant ID, form integration encryption password, pre-shared key, and the hash method to integrate the extension with Cardsave. •	Admin can display any additional information on the checkout page. •	The store do not store any card details as the customers have to add the card data on the hosted payment page. •	Customers can see the Cardsave payment related details in "My Account" section. •	Admin can navigate to Sales > Orders in the backend to see the Cardsave payment details. •	Complete control over the transactions from the admin panel. 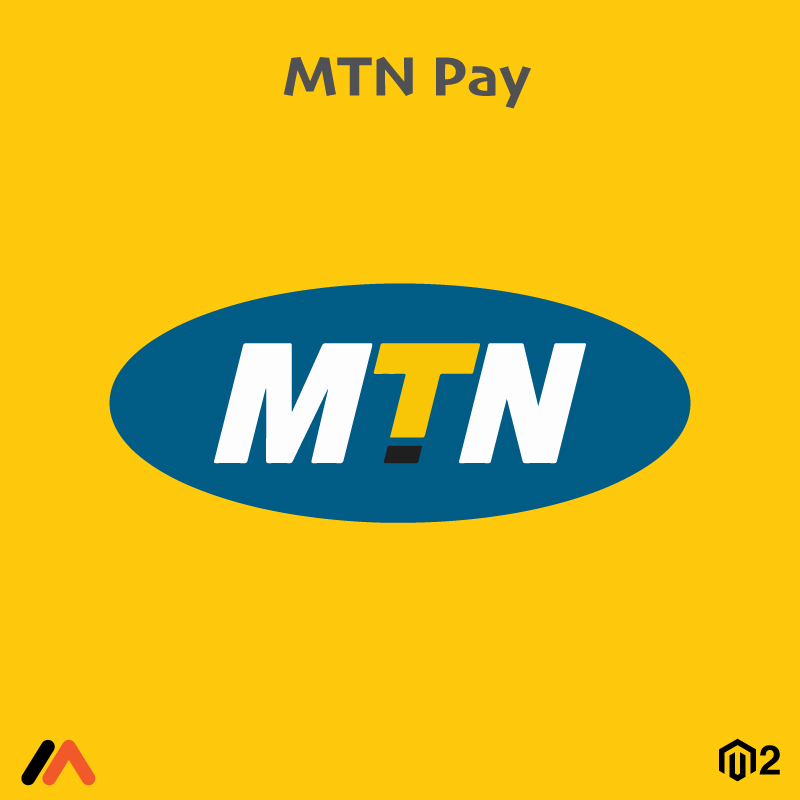 •	Offer better user experience with this payment method as the card details are taken in the website only. •	Use merchant ID and password obtained at the time of registration. •	Supports Authorize as well as Authorize and Capture payment action. •	Set the order status for the new orders. •	Set the vendor reference order prefix string to refer transactions of Cardsave Direct payment method. •	Option for credit card types to accept payments using the Cardsave direct payments. •	Select countries to offer this payment method. •	Admin can view the details from Sales > Orders > Order View page in the backend and order Email. •	The extension ensures data security by using the encryption to send the card data on the Cardsave server. Magento 2 Maintenance Page by Meetanshi enables a user friendly page instead of broken website when the store is in maintenance mode or is about to launch! Online Magento 2 stores may undergo changes from time to time such as upgrading to the latest version, installing a new theme, or an extension. At these times, the store needs to be switched in the maintenance mode. However, doing so displays a broken link. It's not advisable from the SEO perspective. The solution is the Magento 2 Maintenance Page extension. Also, if you are about to launch your Magento 2 store, a coming soon page can benefit you. Create a buzz about new products among potential customers. Enable social media buttons to increase engagement with them on social media. Enjoy the benefit of relevant keywords ahead of time using Magento 2 Coming Soon & Maintenance Page extension. The Magento 2 Maintenance Page is a feature-rich extension that allows a countdown timer and adding pictures, sliders or videos in the page background to make it more attractive! Easily switching the store to maintenance mode. A countdown timer to switch back to live site. Make the maintenance mode page attractive with pictures, sliders or videos in the background. Grow your subscribers' list with a subscription box in the maintenance page. Enable social media buttons for increasing engagement with potential customers. Set up whitelist IPs that includes testers or developers. Integrate Google Analytics on the maintenance page. Leverage SEO benefit for the relevant keywords ahead of time. 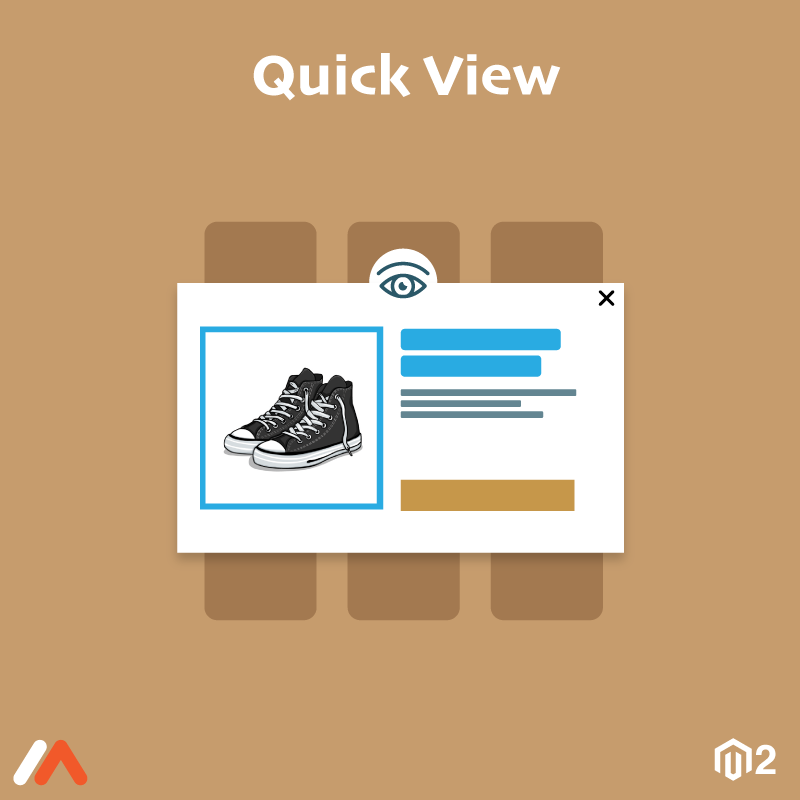 Magento 2 Quick View by Meetanshi offers a convenient quick view popup to the visitors in the storefront. Enable quick view popup on category page, product widget, recommended products, upsell and many others. Magento 2 Paybox Payment Gateway by Meetanshi facilitates secure online payments and refunds by integrating Magento 2 with Paybox payment gateway. Secure online payments are of prime importance in the Magento 2 stores. Hence, Meetanshi has developed Magento 2 Paybox Payment Gateway extension. 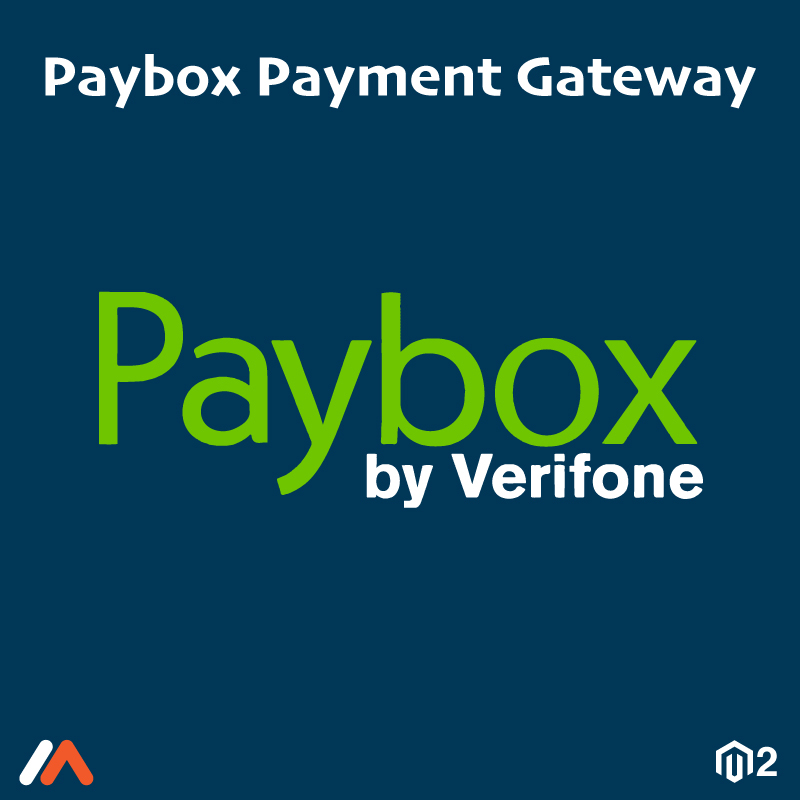 The Paybox Payment Gateway for Magento 2 integrates Magento 2 with France's popular payment gateway, Paybox by Verifone. The extension allows the store owner to reach a wide customer base due to compatible payment options for a huge customer base, owing to the popularity of the payment gateway and the support for 52 currencies! 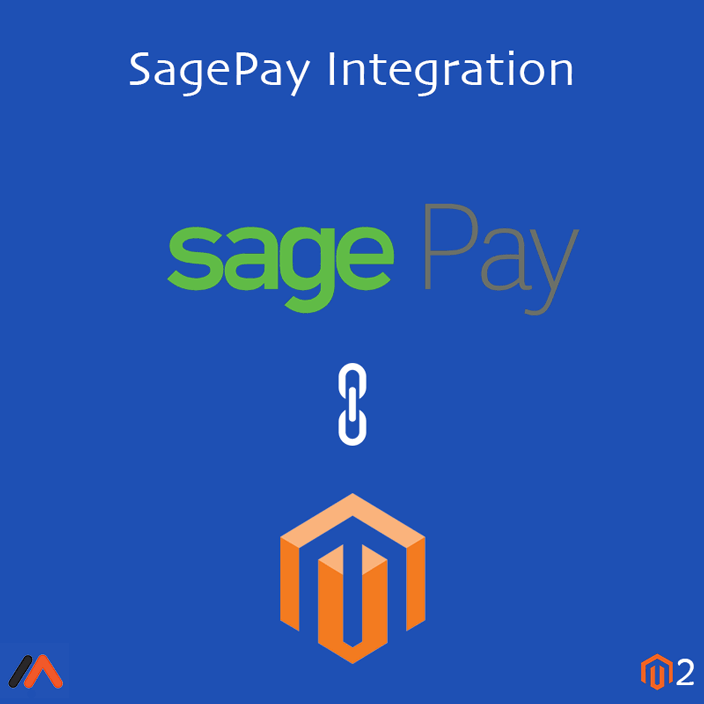 The Magento 2 Paybox Payment Gateway extension supports direct payment API. There are two methods facilitates by the module to process the payments: Authorize only and Authorize and Capture. Moreover, the refund system is also made easy by allowing the admin to refund directly from the backend. Hence, customers do not need to log in for the refunds! Offer safe online payments in the store. Easily manage the cash flow in the store. Supports the direct API payments. Easy refunds with the support for direct refund that allows admin to directly refund to customers from the backend admin panel. Customers do not need to log in for this process. Supports payment processing with: Authorize only and Authorize and Capture. 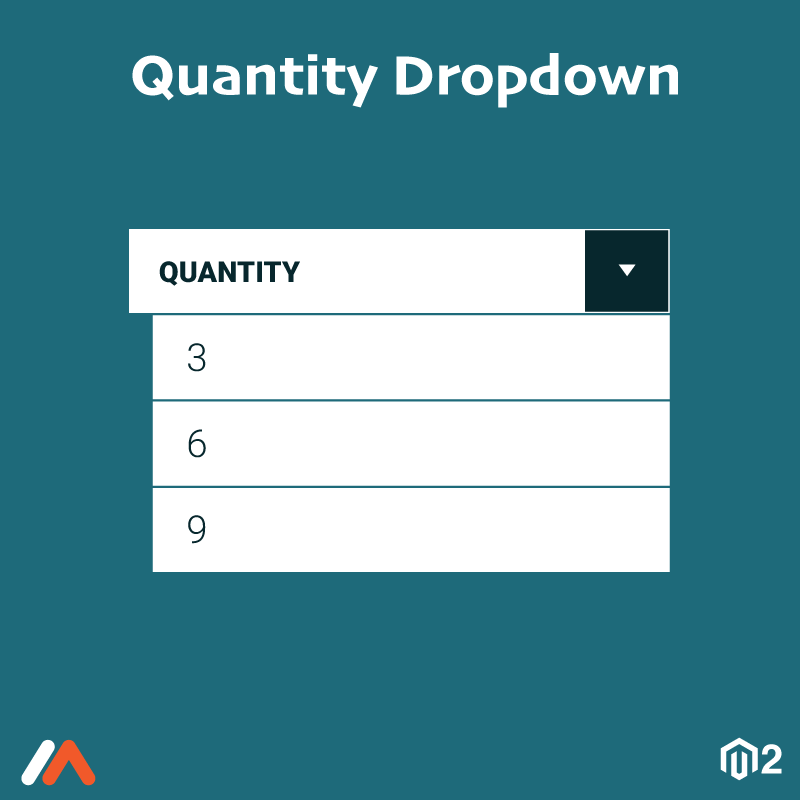 Magento 2 Quantity Dropdown by Meetanshi allows store owners to enable the quantity dropdown instead of the quantity box to restrict bulk purchase. Magento 2 allows customers to input the quantity items in the quantity box at the time of the purchase. If the store owner want to set a minimum number of purchase or restrict the bulk purchase, the quantity box does not support this validation. Hence, Meetanshi has developed Magento 2 Quantity Dropdown extension. The Quantity Dropdown for Magento 2 extension allows admin to enable the quantity dropdown instead of the quanity box. It enables the admin to sell minimum number of products as a part of advertisements or campaigns. Also, stock management can be done easily by restricting bulk purchases. With Magento 2 Quantity Dropdown extension, the user can select the item quantity within a specific range only. Effectively save the shipping and the packaging costs of fragile or heavy products with the help of the restriction on the quantity set using the module. Admin can use quantity dropdown list in place of the input box. Admin can set product quantity incremental value with total price in quantity dropdown. Set the maximum quantity value to show quantity for increment type dropdown. Hide the quantity value that is larger than the quantity in stock. The extension enables the dropdown list on the product page, category page, and wishlist page. Set quantity dropdown for all or selected products of the Magento 2 store. The extension can be used with simple and configurable Magento 2 product types. 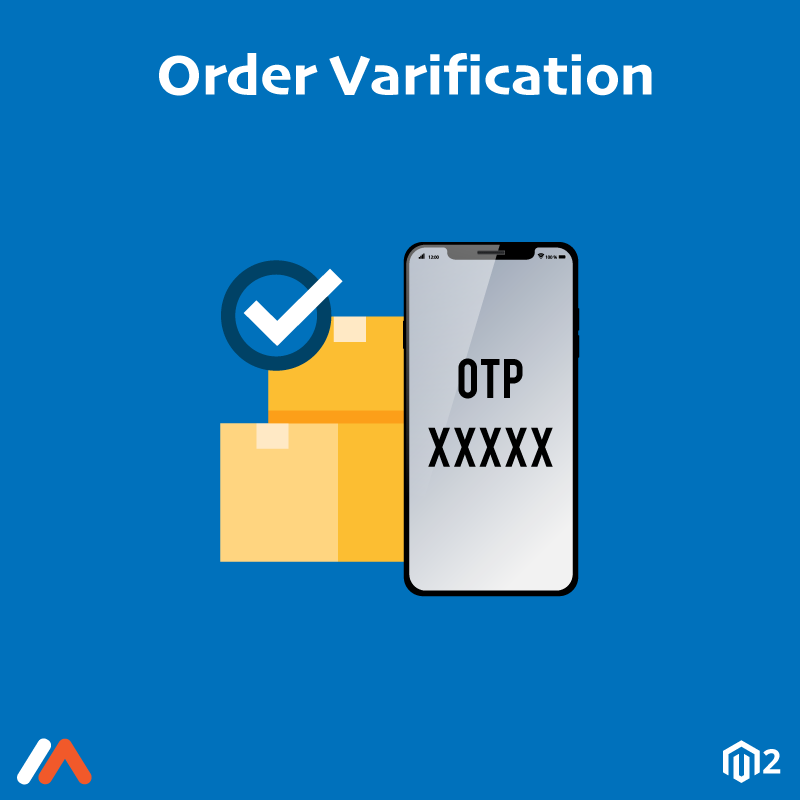 Magento 2 Order Verification by Meetanshi help prevent fake orders by validating them via OTP sent to the registered mobile number, at the checkout step. As a Magento 2 store owner, have you ever faced the issue of fake orders placed? Such orders are a part of prank or mischief that proves wastage of time and money. The order management system can be improved and such fake orders can be avoided using Meetanshi's Order Verification for Magento 2! The idea to verify the orders at checkout via OTP before placing an order can be implemented using this extension. Restrict the "Place Order" button unless the customer verifies the order via OTP. Also, "Resend OTP" button can be implemented with customized text. Save yourself from the turmoil of packaging, delivering and order management of fake orders with Magento 2 Order Verification module. Improve security with OTP verification using the registered mobile number. Better order management system with reduced fake orders. Compatible with Msg91 and Textlocal to send SMS for the OTP on registered mobile number. Admin can enable order verification on the specific payment methods. A customer can access the "Place Order" button only after the order is verified using the "Verify Mobile Number" button and enter the OTP sent to the mobile number. Support for a custom message for the OTP text SMS. Set a customizable message at checkout step for the "Resend OTP" button in the frontend. Enhanced security. Magento 2 Email Quote by Meetanshi allows customers to request for quotation and admin to place a customized order from backend as per the requirements. Do you own a Magento 2 store selling wholesale or bulk products? Ever had the need to negotiate with customers for prices? Meetanshi offers a perfect solution to these requirements. 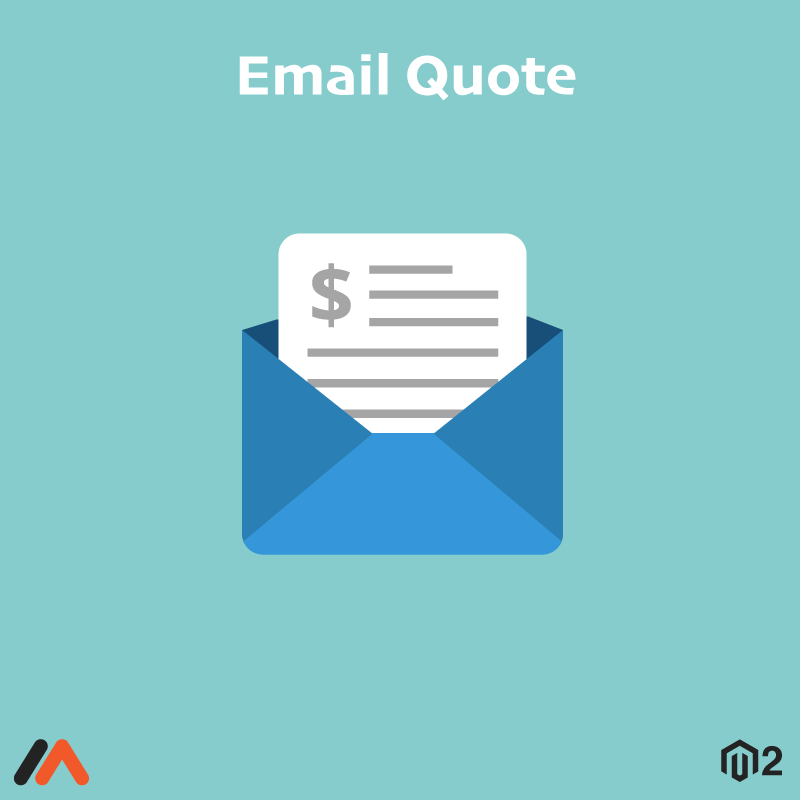 Magneto 2 Email Quote extension enables customers to send a quote request by emailing their cart with the selected options. Magento 2 Email Quote extension is apt for stores having customizable or wholesale products. It is not feasible to display a specific price as it may vary based on the customizations. With the help of the module, customers can request for quotation and admin can easily understand their requirements. The extension offers a backend grid to create and manage the customers' quotes. It also allows admin to create a customized an order quote based on the customers' quote and sent it to customers via "Email Quote" button. Coupon codes can also be directly applied from the backend! The Magento 2 Email Quote extension makes it easy for the customers to place such a customized order. The customers get Magento 2 order quote through Email which has a direct link that helps proceed to checkout quickly. Customizable button label for Email Quote. Set Email ID and template to receive customers' cart email for the quotations. A frontend button for customers to fill the details and Email Quote to admin with selected product options. As a customer submits details in the form, the admin gets the whole cart with selected options in the email. Send a Thank You email to customers for submitting a quote. Offers an admin backend option to create order and Email it to customers. "Email Quote Statistics" backend grid for the quotation requests received to quickly send the quote. Guest users auto-registered when an order quote sent to them via backend admin. Option to apply coupon code in backend while creating the quote. 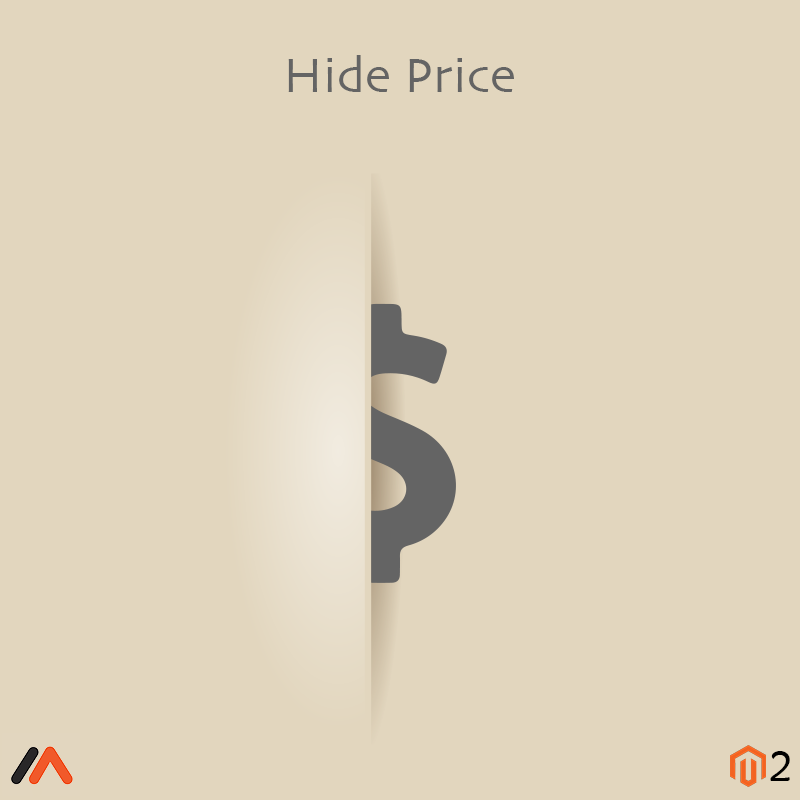 Use the default Magento feature of custom price to create a backend order quote. Easy checkout for customers by emailing them the quote using "EMail Quote" button from the backend Edit and resend the already created and sent quotes from "Email Quote Statistics" with "Resend Quote" action. 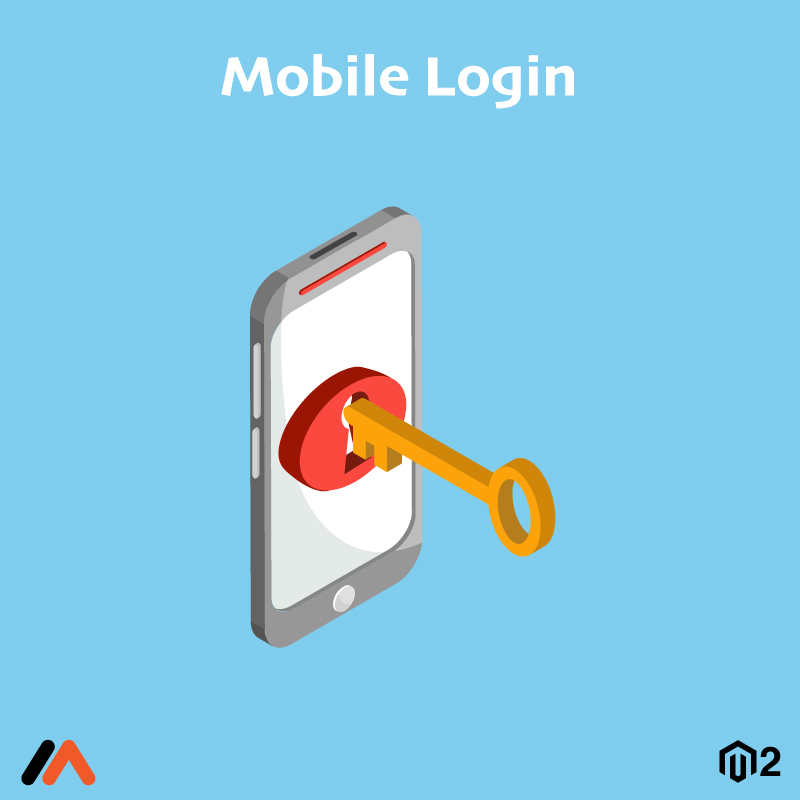 Magento 2 Mobile Login by Meetanshi allows users to register and login in the store after OTP verification of the mobile number. Customer experience and security go hand in hand for the E-commerce business. Both aspects are equally important and one cannot be ignored in the process of improving the other. 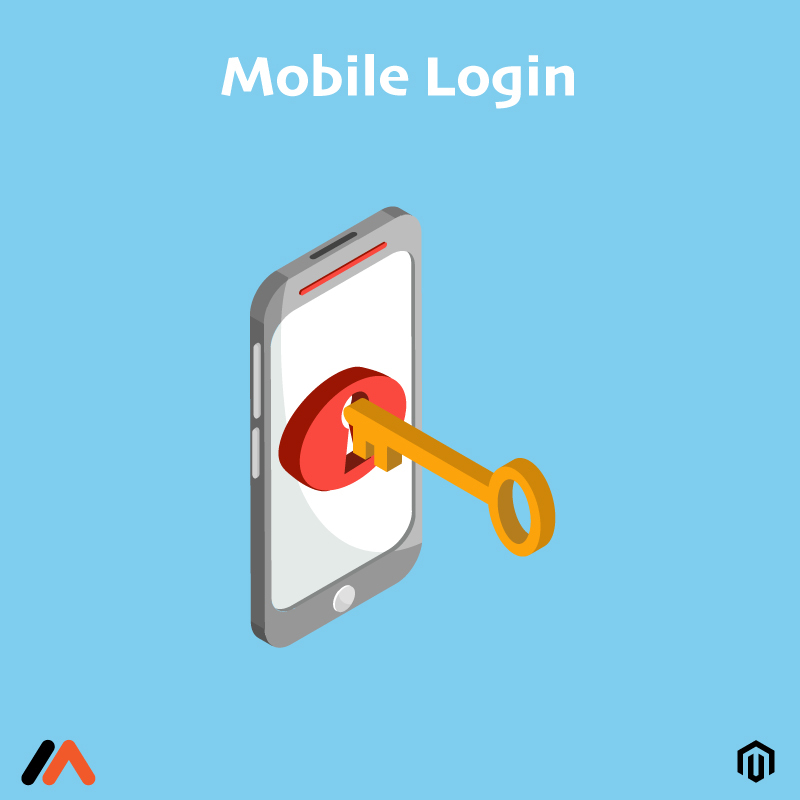 Hence, Meetanshi has developed the Magento 2 Mobile Login extension that allows users to register and login via mobile number after OTP verification. The OTP extension for Magento 2 secures the store by OTP verification of mobile number before registration, login, forgot password and update mobile number. It reduces the chance of spams in the store. Additionally, allowing the users to use the mobile number for these actions make it easy for them. They can skip remembering the passwords to log in! With the increasing use of mobile phones, OTP verification is a quick process for customers and ensures security for the store! Also, the Magento 2 Mobile Login is a feature-pack extension that allows integration of Magento 2 with the preferred SMS gateway! Supports numeric and alphanumeric OTP types. Set the OTP length from the admin panel. Register with the suitable SMS gateway and get the API key and URL to send the OTP SMS for registration and login. Allows promotional or transactional message type to send OTP SMS using the SMS gateway. Allow mobile verification via OTP for actions like registration, login, forgot password, and update mobile number. Allows to set custom OTP SMS text for each action, i.e., registration, login, forgot password, and update mobile number. Create OTP text messages using the system variables. Enable a responsive popup to enter the mobile number for OTP verification when a user clicks register or login button. Allow customers to reset the password with "Forget Password" after mobile verification via OTP. Allow customers to update the mobile number after OTP verification from "My Account" section. Secure each action like website registration, login, forgot password and update password with the module. 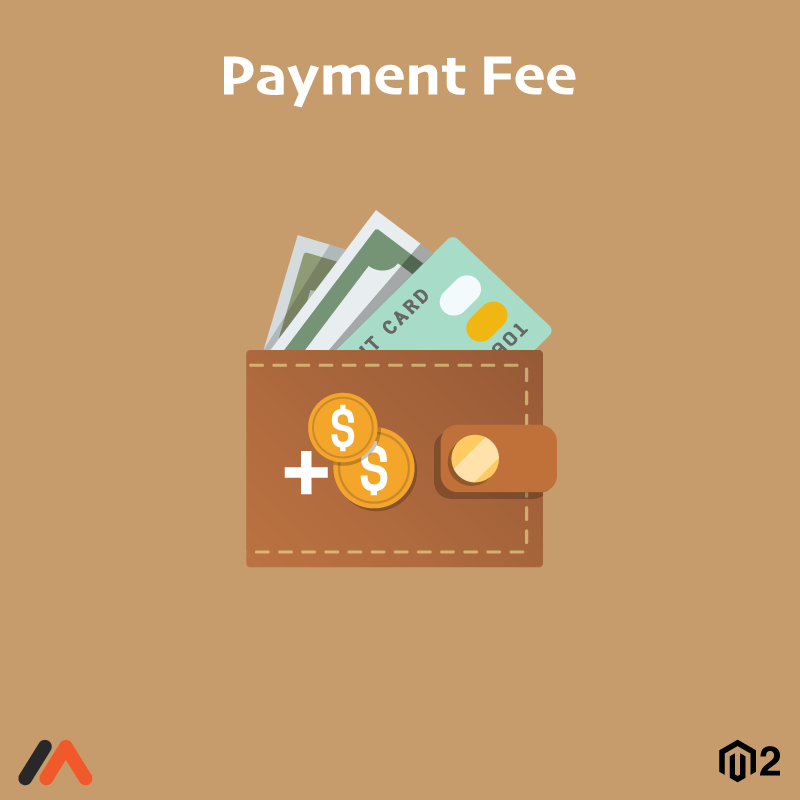 Magento 2 Payment Fee by Meetanshi helps admin to charge extra fees for payment options facility available in the store. There is no doubt that payment methods impact sales in E-commerce stores. 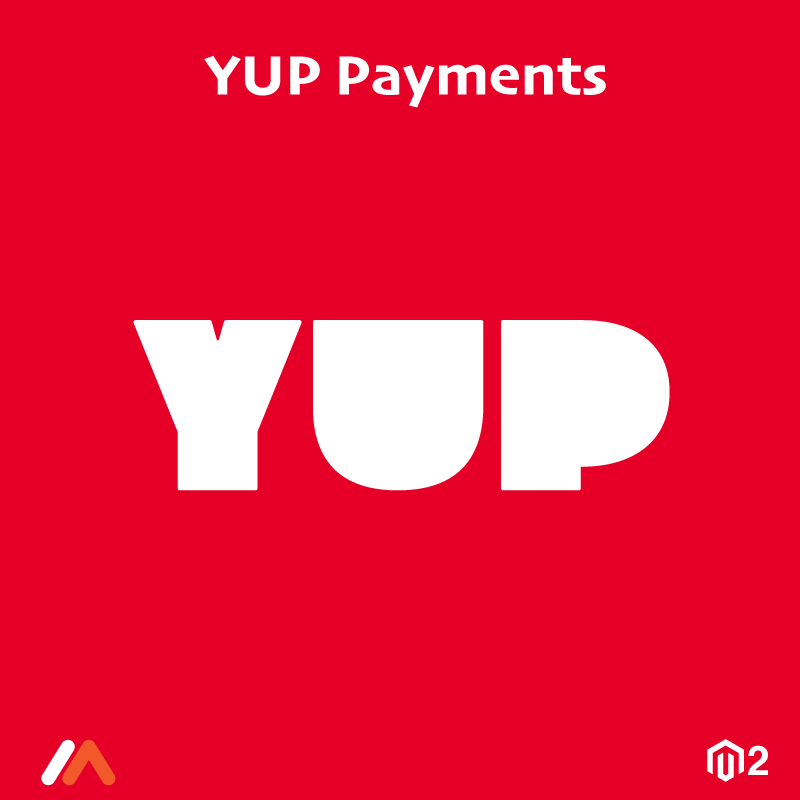 Magento 2 store owners, therefore, provides multiple payment methods in the store for convenient payment options to customers. However, in the process of providing multiple payment options, the store owners end up spending notable money on the facility. To overcome the cost, if the product prices are raised, shoppers may not choose to buy from the store. To overcome the issue, Meetanshi have developed Magento 2 Payment Fee extension that allows the store owner to pass on the payment fees to customers transparently. Offer multiple payment methods like Paypal, bank transfer, cash on delivery, etc. and charge customers according to their selection of payment option. The payment fee is displayed separately in the order summary or customer account as well as in the backend order. The extension facilitates to create as many payment fees as required. Admin can also exclude charging payment fees for particular customer groups. Configure the module to refund the payment fee in case of order refund from the admin backend. Labeling the payment fee separately along with the product price is a good idea to avoid price rise and at the same time offering multiple payment options without having the admin to spend payment fees! The Magento 2 Payment Fee extension allows implementing this idea in the Magento 2 store. Charge payment fees to customers for using specific payment methods. Display custom label using the variable along with payment method while selection. Charge tax on the payment fee and display the fee inclusive or exclusive of taxes. Enable refunds for payment fees with the order refund. Create any number of payment fees for specific customer groups and store views. Set payment fee amount to be charged either in fixed amount or in the percentage of the product price. Magento 2 Paypal Multi Currency by Meetanshi helps improve user experience by allowing customers to make the payments in preferred currency via Paypal. Offering an excellent user experience is important, and in the case of E-commerce stores that are a platform to global customers, the task is not easy! Hence, Meetanshi have developed Magento 2 Paypal Multi Currency extension that allows customers to make payments in their native currency via Paypal. 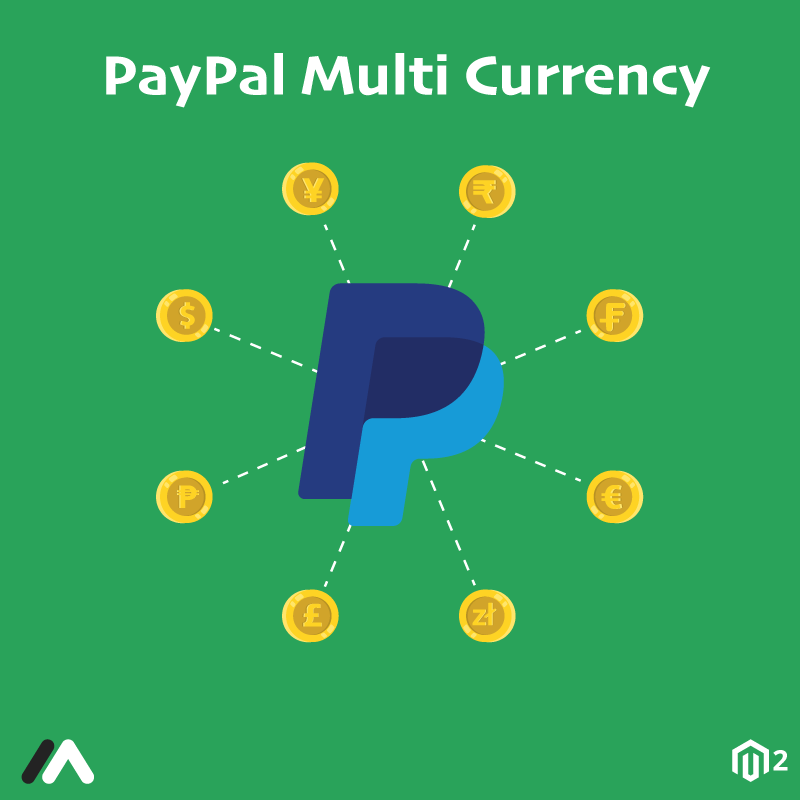 Magento 2 Paypal Multi Currency ensures that the preferred currency for customers remain intact on the Paypal site when they are redirected for payments. The default Paypal express gateway does not allow to process payments in the currency other than the store's base currency. This may confuse the customer and prompt to leave the purchase. Losing a customer at payment step is not acceptable for any business. The extension supports multiple currencies for payment. Check the list of supported currencies here. Enhance the user experience and benefit your business with Magento 2 Paypal Multi Currency extension. Supports multiple currencies for payment to use with PayPal Express payment method. Allow customers to make payment in the currency other than the store's base currency. Improve Magento 2 store's user experience. Let customers make payments in their preferred currency by keeping the chosen currency intact on the PayPal site. E-commerce marketing comes in the form of email marketing, advertisements, etc. But there are chances that such emails or messages may annoy the users. Hence Meetanshi have developed Magento 2 Recent Sales Notification extension for Magento 2 stores that promote trending products to visitors in an effective way. Magento 2 Recent Sales Notification enables a real-time sales notification to online users. It lets the visitors know what products you sell that are liked and purchased by other customers. Such notifications encourage visitors to check out your products that people buy! The notification popup has the link to the product that was sold recently. The visitor may be prompted to check that product and also maybe purchase it for himself. A perfect sales booster module! Automatically show and hide popups displaying details about recent orders. 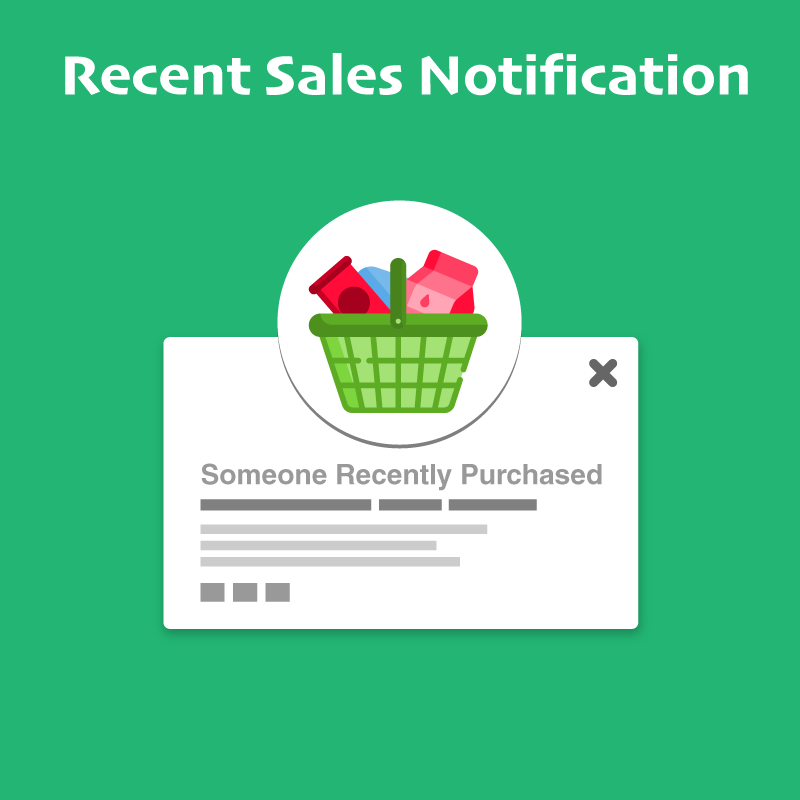 Display recent sales notification popup in desktop, mobile or both. Display popup at the desired location in the store. Display recent sales notification of orders with particular order status only. Set the number of recent orders to show in the popup. You can set it to 0 to display them all one after the other. Use system variables to show trending product details in the customizable the popup text which is HTML supported. Add custom popup text to include details such as product name, product image, customer name, region, price, URL, country, etc. Allow visitors to close the popup with the close button. Differentiate two recent orders notification by setting popup display delay time in between two notifications. Customizable popup background color, border color, text color, link color, and link hover color. Fully responsive recent order notification popup. Magento 2 Product Testimonial by Meetanshi allows showing customer reviews in the website to enhance store creditability! Customers tend to see the reviews of other customers before shopping online. Good reviews make a positive impact and help push a potential customer for conversion! Why not display such a useful content attractive in Magento 2 store! Hence Meetanshi have developed Magento 2 Product Testimonial extension that enables attractive display of customer reviews in the store. The extension is a perfect choice to manage the customer reviews from the backend. Allow visitors to read product reviews before shopping at your store. The module allows admin to restrict review submission based on customer groups. Admin can also disapprove a review to avoid displaying it in the store frontend. 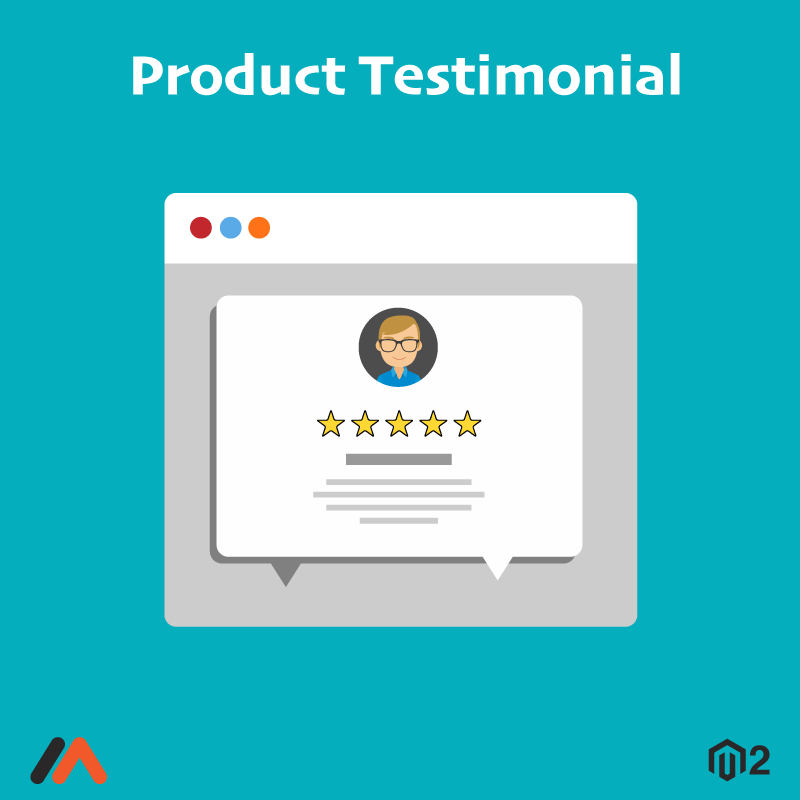 The Magento 2 Product Testimonial extension allows a customer to submit a review with their photograph, nickname, and rate the product on the scale of 1 to 5! It is always good to hear from the customers. It helps to improve as well as good reviews boost store creditability and sales! Set custom page title for the testimonial page. Allow testimonial submission for the selected customer groups only. Configure the settings for admin approval requirement to display the submitted product testimonials. Show the product testimonial page URL in the top link and in the footer as well. Easily auto scroll all the added testimonials under the product testimonial tab on product view page. 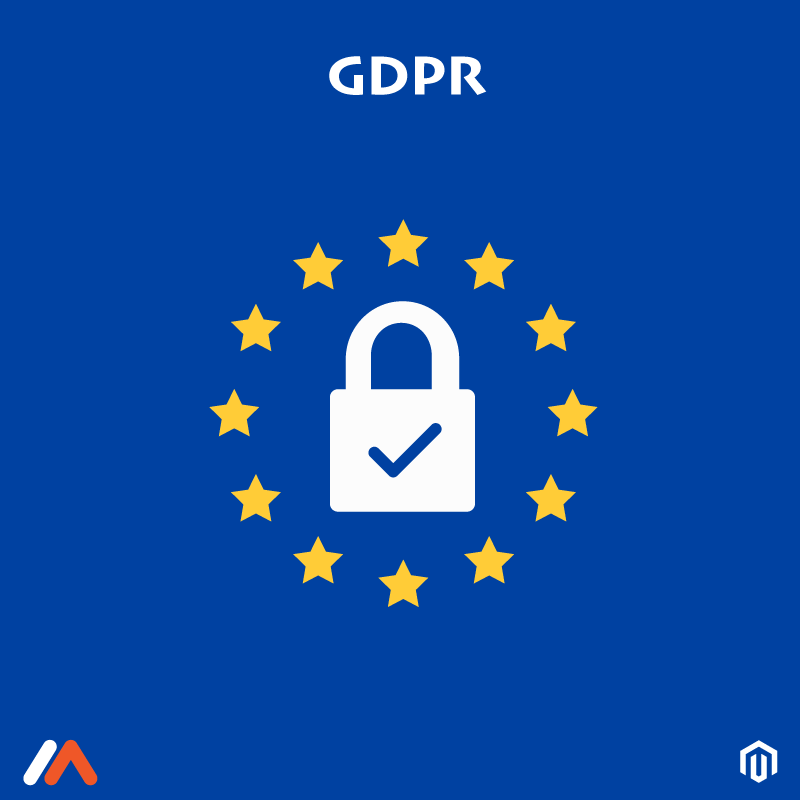 Comply with EU's GDPR by enabling a privacy checkbox with the custom text to get the consent of personal data display on the testimonial page. Send a Thank You Email to customers for sharing their review. Admin is notified via Email when a customer submits product testimonial. A separate testimonial page to show all the submitted testimonials. An attractive display for customer’s name, image, review, and star rating display. Product specific testimonials can be seen under the testimonial tab under each product page. The slider auto changes the testimonials display. Fully responsive testimonial slider and page. 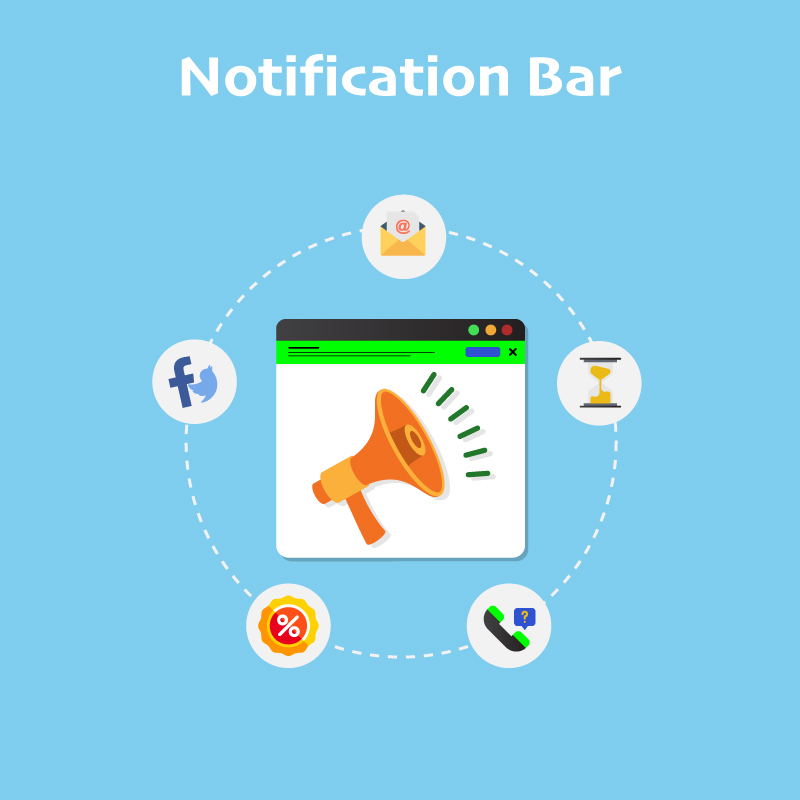 Magento Notification Bar extension by Meetanshi enables an alert bar in frontend to engage visitors with offers, news, discounts, social media buttons, etc. Marketing done the right way is effective in conversion and Meetanshi's Magento Notification Bar extension is the perfect choice to do so! The Magento Notification Bar enables an alert bar in the store that helps promote offers, increase social media engagement and newsletter subscribers, etc. Manage your marketing efforts without annoying the visitors with the help of the module! Keep your store visitors updated with the latest offers and news! Boost traffic and hence increase conversions in the Magento store with minimum efforts! Request customers to communicate directly. Enable/disable the module as per the requirement. A multi-purpose extension such as promoting a sale or discount, communicate with store visitors, enhance social networking, increase subscribers, or display a countdown timer. Select bar size and position for the frontend display. Pick one of the many transition effects to attract visitors with its entry. Allow users to close the bar in case they don't want to see it. Enable/disable the notification bar in mobile phones from the backend. Admin can customize notification bar text, color, button text, background color to make it attractive to engage users. Fully responsive and mobile optimized top and bottom notification bars. Magento Paypal Multi Currency allows customers to make payments in multiple currencies in Magento stores! For international stores, the customers get confused when making payments via Paypal, as the base currency of Magento store is displayed instead of the chosen currency. Such a confusion will make a customer cancel the purchase. This was the problem faced by Magento store admin who uses Paypal as a payment gateway. But not anymore! Meetanshi has developed Magento PayPal Multi Currency extension that keeps the chosen currency intact throughout the order process! To avoid it, Meetanshi's Magento Paypal Express Multi Currency module can be used for smooth payment process. Also, improve the user experience of Magento store as it supports PayPal Express Checkout payment method and payments in multiple currencies! Admin can accept payment in the currency other than Magento store base currency. Customers can make payments in their own preferred currency by keeping the chosen currency intact even on the PayPal site. Better user experience by allowing to pay in the preferred currency. Magento 2 stores must offer secure payment facility to customers in order to win their trust and have a smooth payment system. Meetanshi have come up with Magento 2 Barclaycard Payments extension to allow Magento 2 store owners to accept secure online payments through UK's Barclaycard Payment gateway. 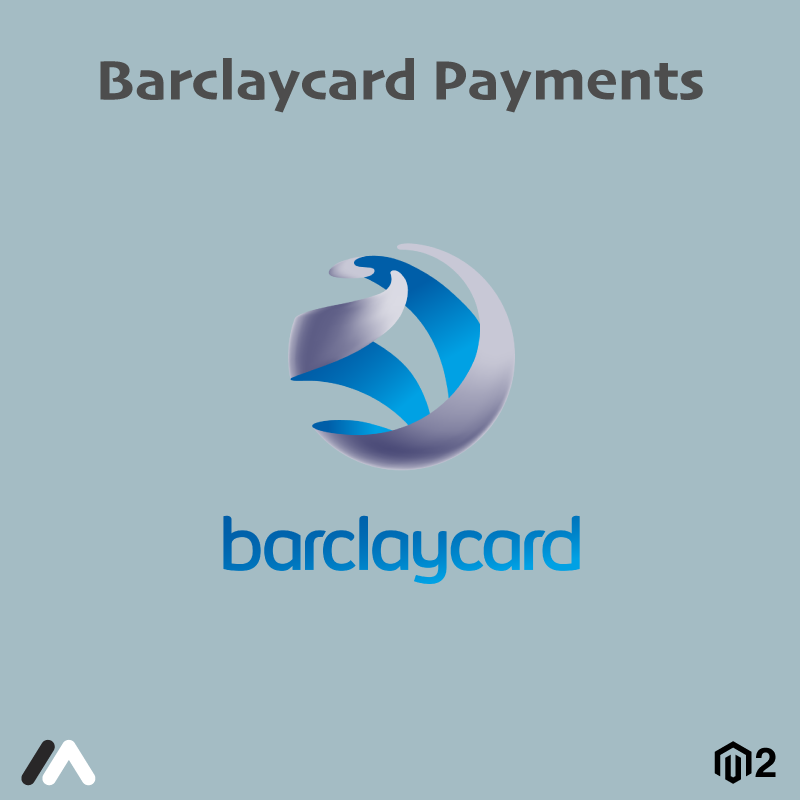 Magento 2 Barclaycard Payments supports accepting two types of payments: ePDQ Direct payment and ePDQ hosted payment. The ePDQ direct payment captures payments on site. The ePDQ hosted payment enables checkout using a hosted payment page for secure transactions using 3D secure and CVC verification. The card details are stored in the store's servers and sent to the payment gateway using encryption. 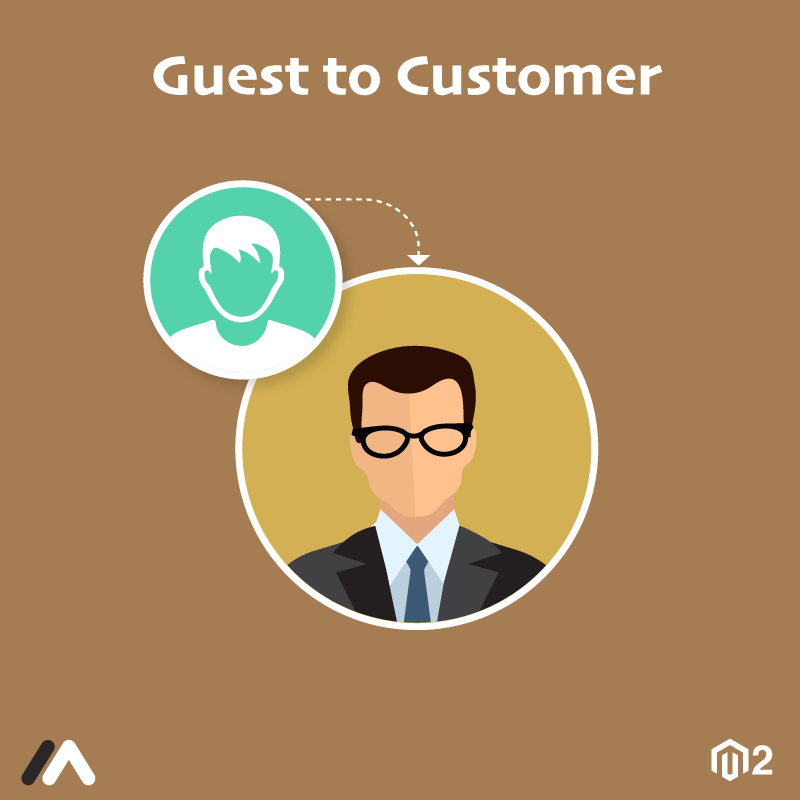 Admin can handle more customers as card data stored and processed in the Magento 2 store. Allows creating orders from backend using Barclaycard Payment method. Supports all types of major credit and debit cards along with Paypal. Card details are stored on the server of the payment gateway. 3D secure payment processing for safety against theft. Supports Authorize as well as Authorize and Capture payment action. Magento 2 Shipping Rules lets admin create flexible shipping rules based on the product attributes and shipping cart attributes. Default Magento does not allow to configure flexible shipping rules. E-commerce business demands to configure shipping rules based on attributes of the products, cart, delivery, etc. So, Meetanshi has developed Magento 2 Shipping Rules extension to let the Magento 2 store admin implement custom shipping rules. 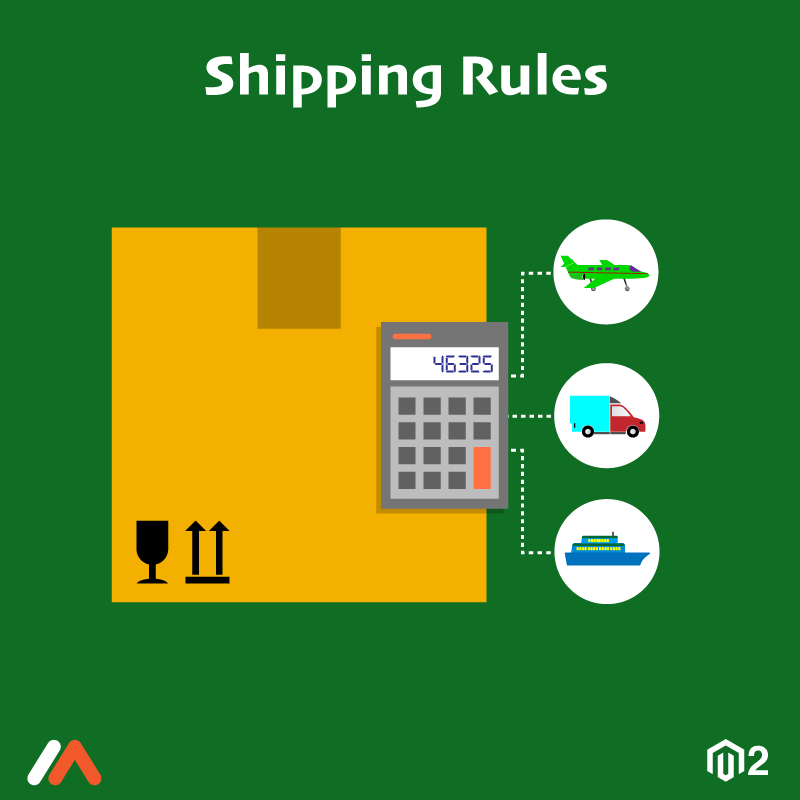 Create an unlimited number of shipping rules with Magento 2 Shipping Rules. Offer flexible shipping options, adjust shipping options per product, offer discounts, and much more! Allows custom shipping rules based on product & shipping address conditions and cart attributes. Support for an unlimited number of shipping rules. Option to set rule name to easily recognize it. Option to select shipping carriers and add carrier shipping method names to apply the rules on. Create shipping rules based on store views and customer groups. Prioritize the rules and apply them if a product fits multiple shipping rules. Create custom shipping rates per product or per order. Select any of the three calculation methods, i.e., replace, surcharge or discount. Set and charge shipping rate per order item or per product. Set handling shipping rate in percentage. Define rules using product conditions and condition combinations. Magento Image Clean by Meetanshi helps optimize the store by deleting the unused product and category images. Improve customer experience at your Magento store with increased page load speed. Improve the page load speed and optimize the Magento store by deleting the unused product and category products with Meetanshi's Magento Image Clean. The module helps free some disk space! Optimized store with improved page load speed delivers a good user experience. Admin can get rid of the unused images from the media folder with the Magento Image Clean. 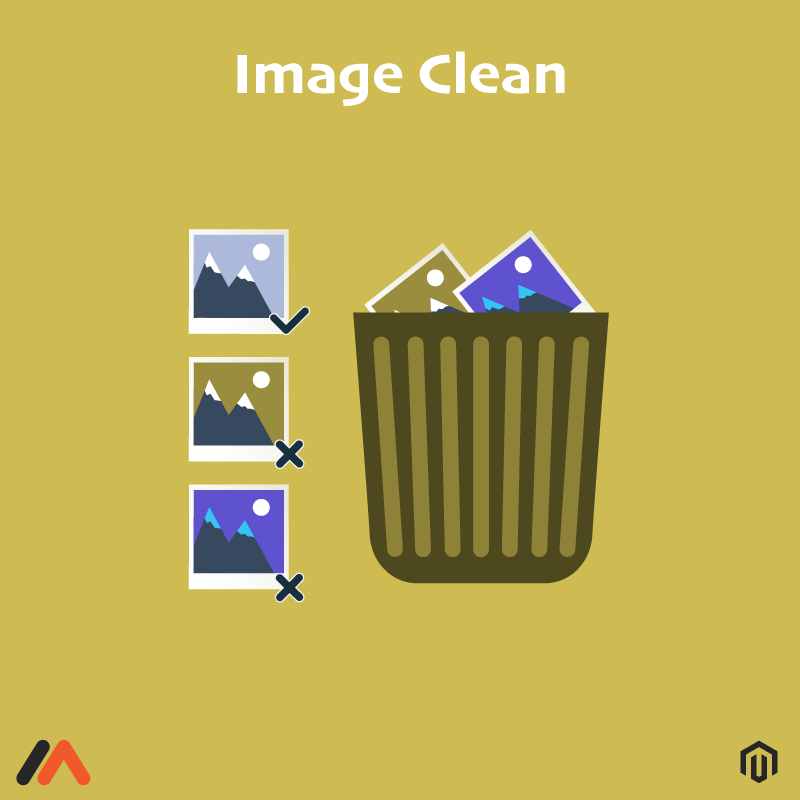 Image Clean for Magento allows admin to verify the images to make sure that only unused images are deleted. The backend grid lists all the unused product and category images and its path. It is important to back up the website data before installing Magento Image Clean extension. Offers separate grids for the list of unused product and category images. Delete multiple images easily with a single click after selection. Option to delete a single image by using the delete action. The grid does not contain images from the deactivated categories and disabled products as they are not considered as useless. Optimize Magento store by removing unused images. Magento 2 Dealer Inquiry by Meetanshi helps manage new dealer inquiries by enabling a custom form for the same. 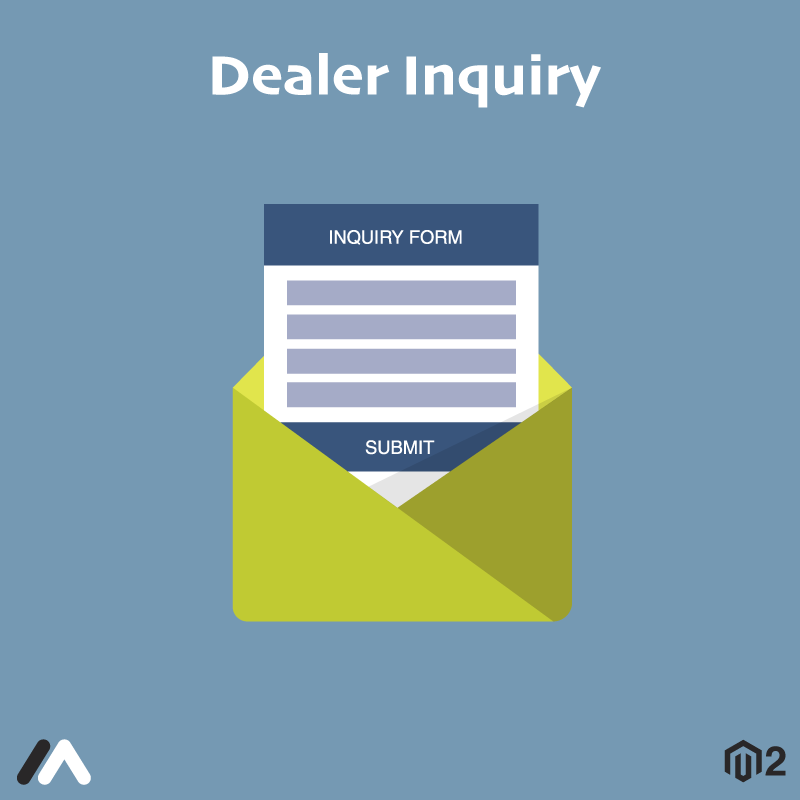 Collect dealer inquiries easily with a custom form using Magento 2 Dealer Inquiry extension by Meetanshi. Escape from the boring task of processing dealer inquiries, analysis, approval and creating dealership accounts. The module helps admin collect dealer inquiries, lists inquiries in the backend and allows to create customer accounts for dealers when approved. Also, customers can submit the dealer inquiry quickly using the custom form. Eases the task of dealer inquiries management. Enables a custom form for dealer inquiry with a preferable page URL. Option to set SEO-friendly meta title and description for the page. Display the dealer inquiry page URL in the top link or in the footer. The new customer accounts created for the dealers are automatically added into the specified customer groups. Admin can set custom form title, description, submit button label and success message. Option to show only the essential form fields in the page. Option to specify the file types allowed to be attached while submitting the dealer inquiries. Admin can customize the labels of the form from the backend. Email notifications for Admin on a new dealer inquiry submitted. Email notification for customers on a successful inquiry submission and new account registration details. Security from spams with the integrated Google reCAPTCHA in the custom form. Backend grid to manage dealer inquiries easily. Admin can create a new customer account from the grid itself. 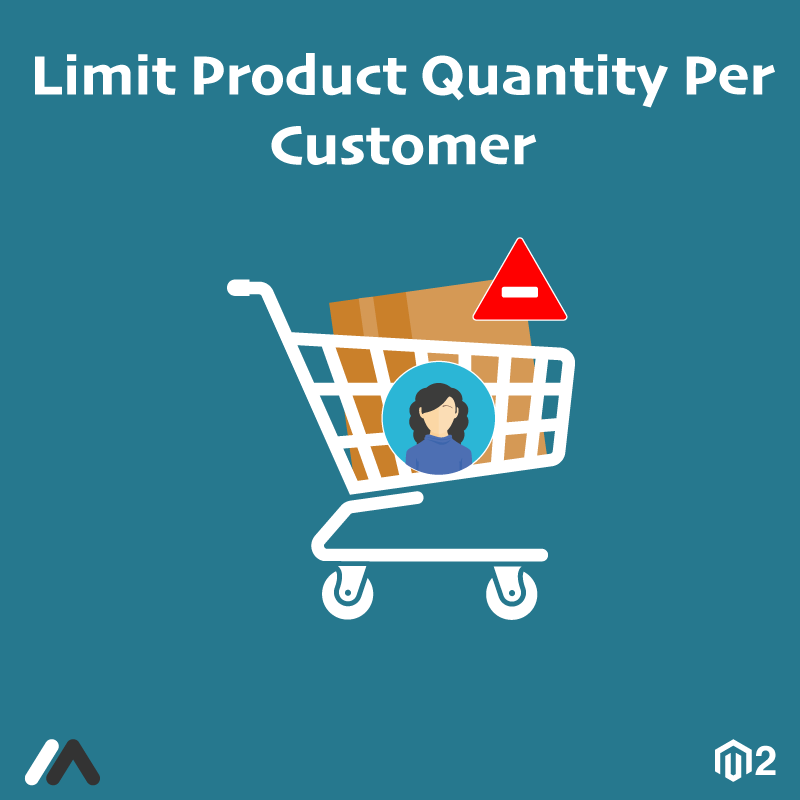 Magento 2 Limit Cart Quantity by Meetanshi helps admin in stock management by setting a limit for cart quantity based on customer groups. The default Magento 2 allows setting minimum cart quantity. 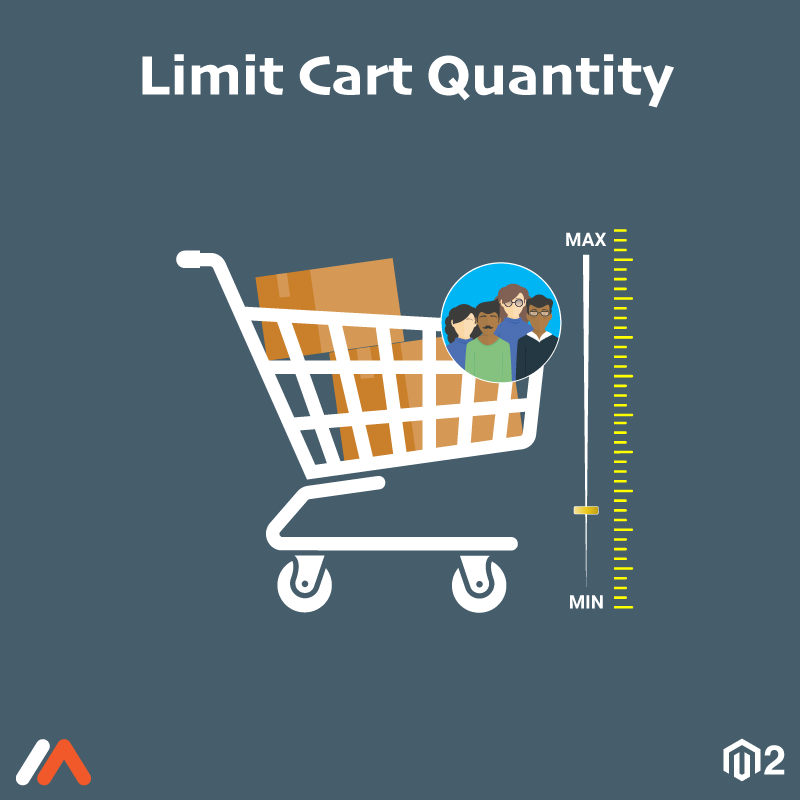 But to set a minimum and maximum range for cart quantity based on customer groups, check Meetanshi's Magento 2 Limit Cart Quantity extension! The Magento 2 Limit Cart Quantity allows admin to restrict the total number of items allowed in a cart based on customers groups. Manage the stock of products in the store with the module. Set restrictions based on customer groups to incur maximum profit with minimum efforts. When a customer places an order with cart quantity that is restricted, an error message will be displayed, not allowing to checkout successfully. Improve sales performance, stock management and minimize the shipping costs with Magento 2 Limit Cart Quantity extension. Set a limitation for the total number of products in the shopping cart. Set the minimum and maximum quantity limit on the basis of customer groups. The module enables an error message in the frontend when the cart is not qualified for successful checkout. Magento 2 eWay Recurring & Subscriptions allows selling subscription products and accept recurring payments in Magento 2 store. Magento 2 eWay Recurring & Subscriptions allows store owners to offer subscription products in their store. It helps customers to escape the process of buying the same product time and again. Using the module, Magento 2 stores can offer a subscription for their services or products that are used in day to day life or memberships. The extension supports to update credit card details, choose subscription periods, Email notifications and much more. Moreover, the store receives a fixed amount of revenue from the subscription products. Create flexible plans with the Magento 2 eWay Recurring & Subscriptions extension and benefit the store as well as customers! Support for simple, downloadable and virtual Magento 2 product types. Support for AUD currency to accept payment from Australian customers. Option to set a custom title for the eWay recurring payment method in the frontend. Set order status for each order placed through eWay recurring payment method. Select credit card types for accepting payments. Support for sandbox and debug mode. Define subscription types and assign products to the added subscription types from the backend. Option to set the eWay recurring period units. Admin can limit the product subscription cycle by setting the maximum billing cycles for a created subscription type. Enable product specific subscription from product edit. Let customers define the start date of the subscription that allows beginning Magento 2 recurring payments at any day specified by the customer. Customers can select the subscription period, frequency and billing cycle for subscription products. All the selected subscription options are seen on shopping cart and checkout page. Once the subscription order is placed, customers can see all the subscription-related details from their My Account section. Customers can update credit card details from the "My Account" section. Admin can navigate to Sales --> Orders in the backend to see subscription order details along with the customer and order information from. 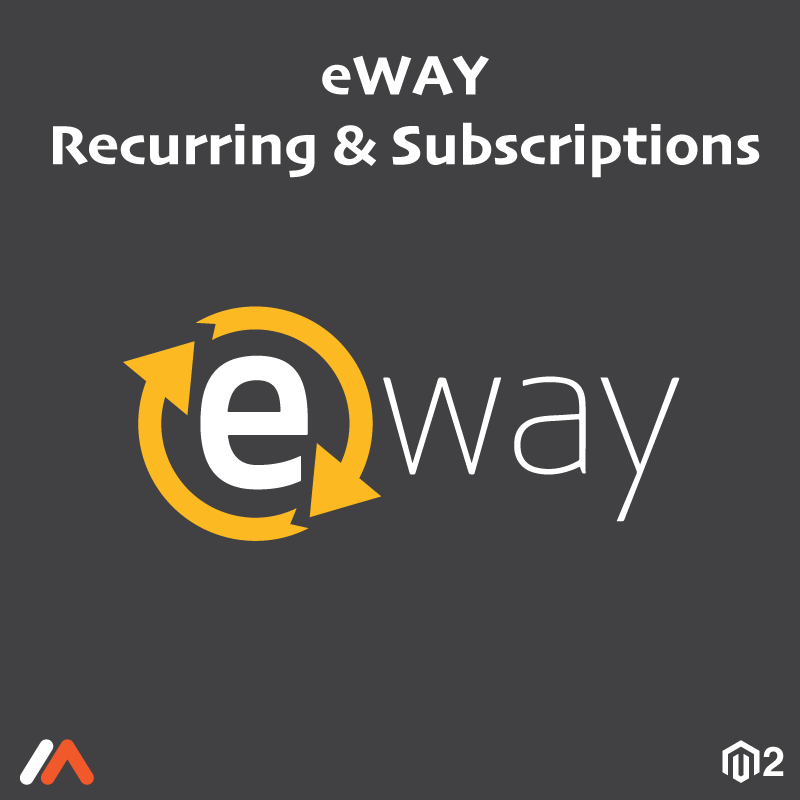 Navigate to eWay Recurring and Subscriptions --> Manage Subscription Schedule to view same day (today), pending and completed subscription schedules in 3 separate grids. To edit and update subscribers and subscription details navigate to eWay Recurring and Subscriptions --> Manage Subscribers. Admin can delete a subscriber. Allows enabling Email Notification for Next Subscription Payment Reminder, Subscription Payment Failure, Credit Card Expiry Reminder, and Successful Subscription Cancellation. Restrict buying two subscription products together, or buying another product with a subscription product. Fake testing accounts and bot registration is a headache for Magento 2 store admin. Steps to prevent such actions is a must for protection against spams and ensure smooth functioning of the store's features. 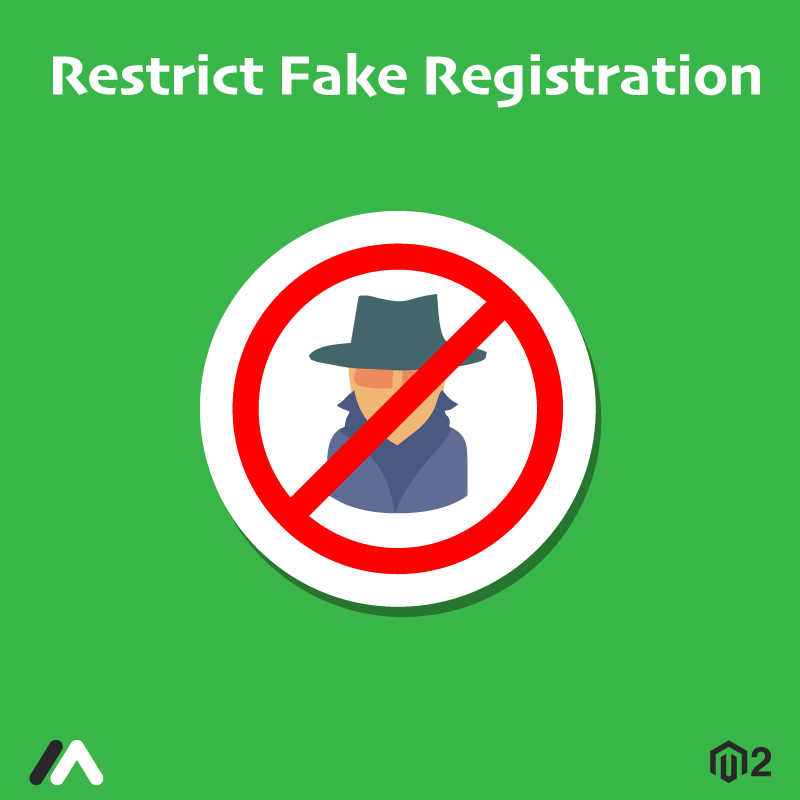 Meetanshi has developed Magento 2 Restrict Fake Registration extension to help admin restrict fake signups and bots registration! The module helps restrict dummy sign-ups by restricting specified domains for Emails used to register. Also, the character length limit can be set for the first name and last name used to register as the bots have long machine-generated names. 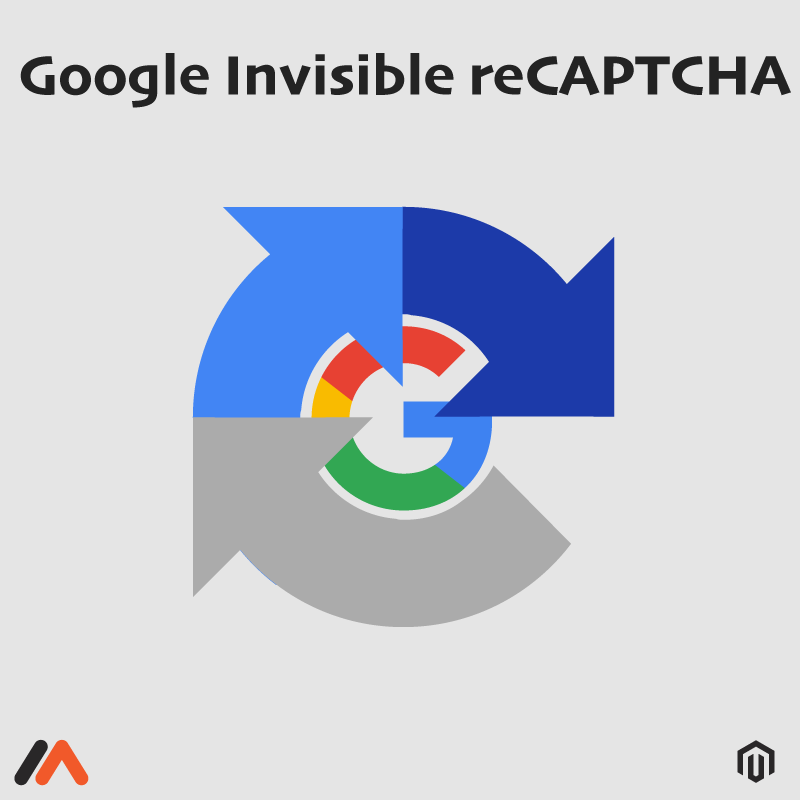 Magento 2 Restrict Fake Registration module offers an option to enable Google reCAPTCHA v2 for security against undefined bots. Ensure secure customer experience on your Magento 2 store and hence win customers' trust! Set the list of domains to restrict Email IDs used for signup. Set validation for the character lengths of the first name and last name used for signup. 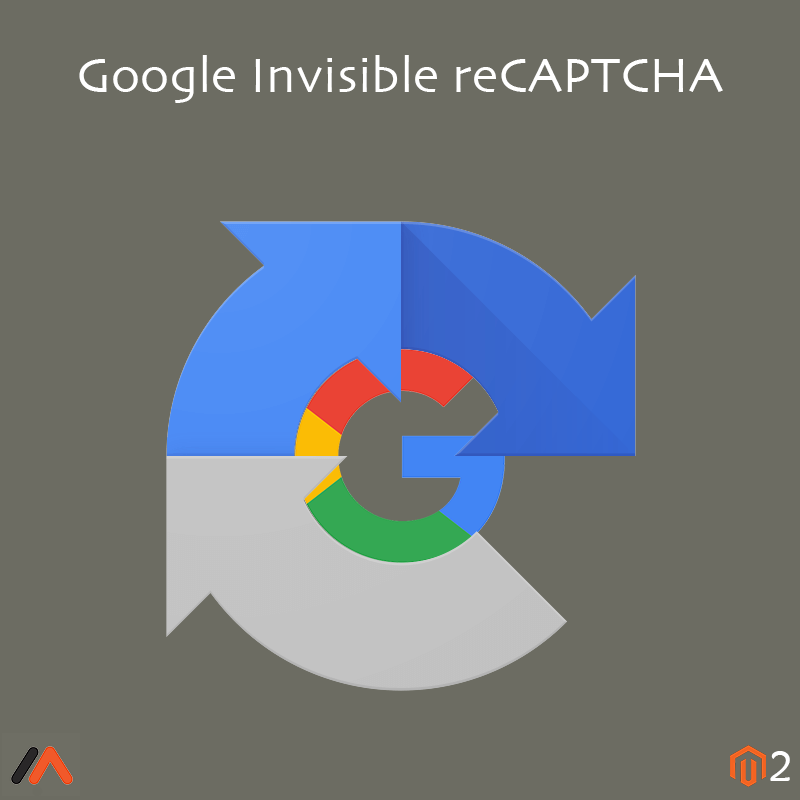 Enable Google reCAPTCHA v2 for added security against undefined bots. Secure store for improved customer experience! No one likes to go through the process of refund, whether it be a customer or the merchant. But it can't be avoided, even in the E-commerce business. 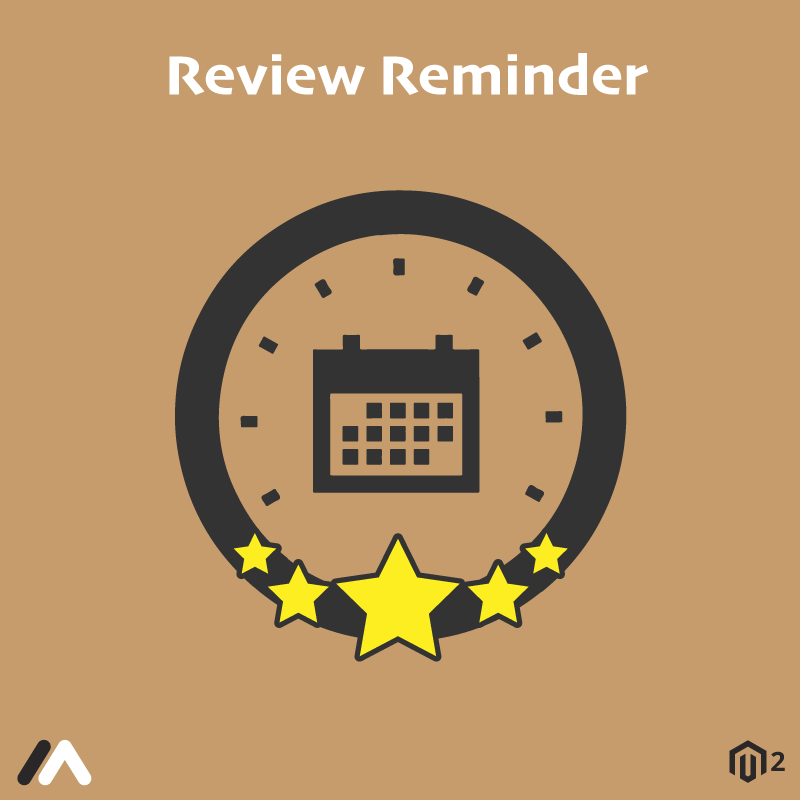 For Magento 2 stores, it is necessary for admins to organize an easy refund request process for enhanced customer experience. Meetanshi has developed Magento 2 Refund Request extension that allows customers to request for refund and helps admin to handle those requests easily! 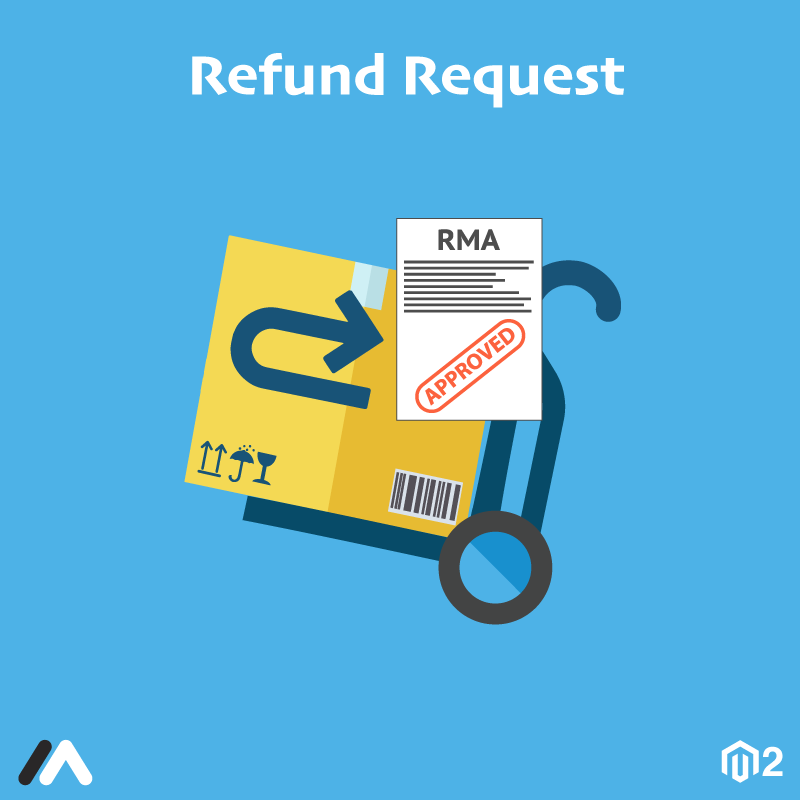 The Magento 2 Refund Request extension enables a separate refund request form in frontend which can be used by customers to submit a request for a refund without having to log in. The module also enables a backend grid for admin to easily manage those refund requests. Customers can request for order refunds using refund request form. Admin can set custom form title and description for the refund request form. Google reCAPTCHA in the refund request form to avoid spammy submissions. Email notification to admin when a new refund request is submitted. Email notification to customers on successful refund request submission. Option for admin to enable extra fields in the frontend form apart from the mandatory ones. Allows adding refund reasons in the backend to allow requests for the specified reasons only. All the refund requests are stored in the backend in a separate grid to handle refund requests. Customers can fill order details, specify the reason for refund and submit requests from the refund request form, from the top link section, in the frontend. Easy to handle refund requests and deliver a better refund experience to the customers. The Magento 2 Cookie Notice extension helps to make your store comply with EU's cookie laws. The extension also allows customizing the display of the cookie notice on the frontend. Admin has the option to modify the color, text, background etc., of the notification bar or popup. Win your customers' trust by ensuring them that your business follows GDPR's cookie law. 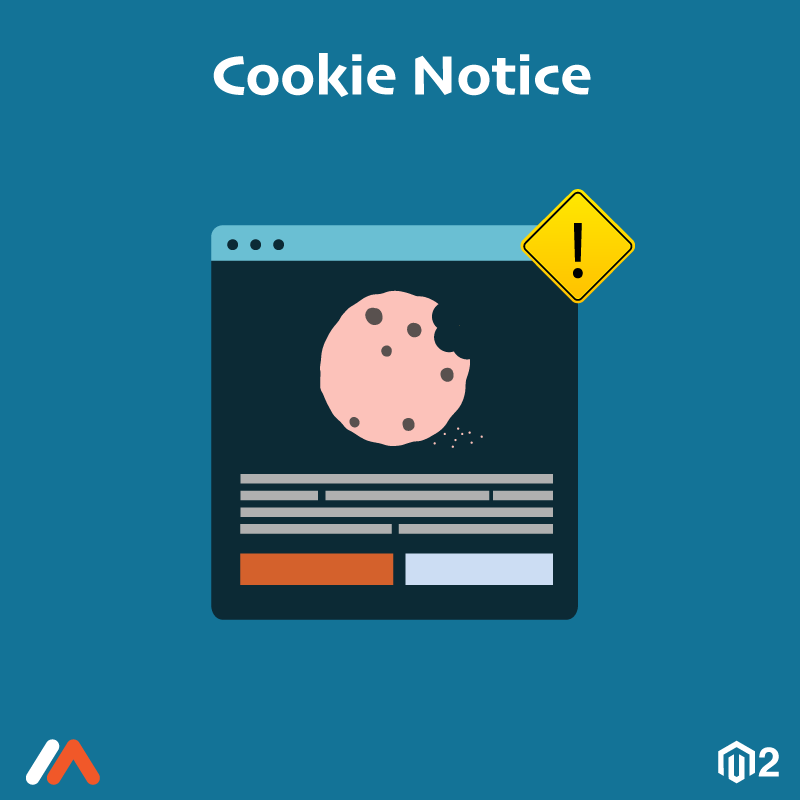 Enable a clean cookie notice with Magento 2 Cookie Notice extension in store frontend. Enable or disable the module as per the requirement. Option to customize cookie consent message. Option to customize text, background color, and position of the Magento 2 cookie notice bar or popup. Allow users to accept or close the cookie consent. Option to add CSS style to modify the display of the cookie bar. Auto-hide cookie notice bar or popup after a specific time period. With an increasing number of mobile phone users, E-commerce store business is growing fast. Providing facilities accessible from the phone itself will enhance the user experience of the store. Similarly, for Magento stores, Meetanshi developed Magento Mobile Login extension to let customers login via mobile number. Magneto Mobile Login extension allows customers to login or register with a mobile number after OTP verification. Such a facility improves store's customer service and benefits the business. The mobile login is preferred over the default login with Email as it is more convenient. At present, the extension is compatible with Mag91 but it can be customized for compatibility with other SMS gateways. Allow users to register and login through mobile number after OTP verification. Select OTP type from numeric or alphanumeric. Integration with Msg91 Gateway to send OTP for registration and login. Select message type to send to users, i.e., transactional or promotional. Easily enable mobile login with OTP verification for login, registration, etc. Customize SMS text for OTP message to customers. Use system variable to create SMS text for OTP verification messages. The register or login button opens up a responsive popup to add the mobile number and verify using OTP. Allow customer to reset their password whenever they want using mobile number or Email. Customers can update the registered mobile number from their “My Account” section. Enhanced security to register, login, forgot password and update mobile by verifying mobile number with OTP. Magento SMS Notification extension by Meetanshi lets admin notify customers about their Magento store activities via SMS. Usually SMS is preferred over Emails due to its higher response rate, read rate and easy access to mobile phones over internet connectivity! 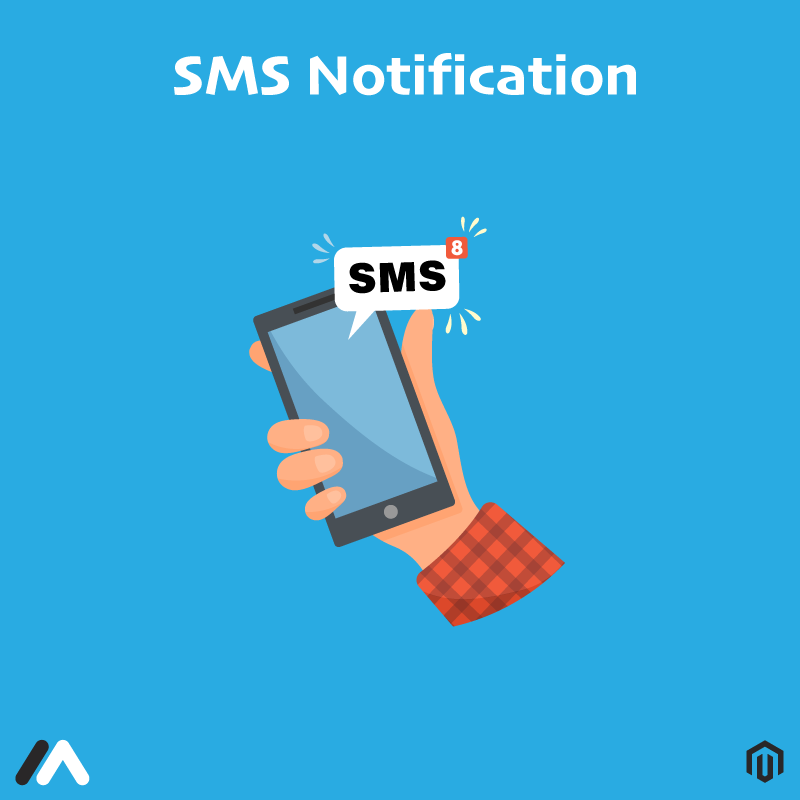 Keeping this in mind, Meetanshi developed Magento SMS Notification extension for Magento stores that allows notifying customers and admin updates via SMS text. Magento SMS Notification is a tool helpful in improving the user experience if the store. The customer can be notified via SMS about activities such as order placed, delievered, canceled or order statuses. Keep them updated with ease using the module. Moreover, admin can use the Magento SMS extension for himself too! Get notified about customers' activities such as new registration, order placed, etc. with an SMS. The Magento SMS Notification is compatible with Msg91 but it can be customized for more SMS gateways compatibility, Enhance user experience and ease the admin's task with the hep of the module. Notify customers via SMS during events such as website registration, order placement or cancellation, etc. Admin can get notified via SMS of customers' activity by inputting the mobile number from backend. Configure API settings by registering with Msg91 to get sender ID, API key and URL and select message type to be sent to customers. Make use of system variables like order_id, first_name, etc. to prepare SMS notification texts. Use of default Magento registration and guest checkout form to collect mobile numbers of customers to send SMS. Immediately after the mobile number is registered with Magento store, SMS notification is being sent for each activity. Build trust and improve user experience by sending handy and quicker SMS notifications to users. Let customers delete their account with the Magento Delete Account extension. No more tickets to be processed to remove the customer account. Customers can navigate to "My Account" section and request for removing their account. A confirmation link in Email will be received that will delete the account from Magento 2 store permanently. The module makes sure that only customer and no one else can delete their account with the help of two-stage process of deletion. Moreover, it reduces admin's task to process the account removal request tickets. Admin can set the Email from which the delete confirmation Emails will be sent and select templates for the same! Enable/disable the extension from Magento backed. Set the Email sender and select template for delete account confirmation Email sent to customers. Customers can request deletion of their Magento customer account by checking "Delete My Account" and clicking submit button from their "My Account" section. 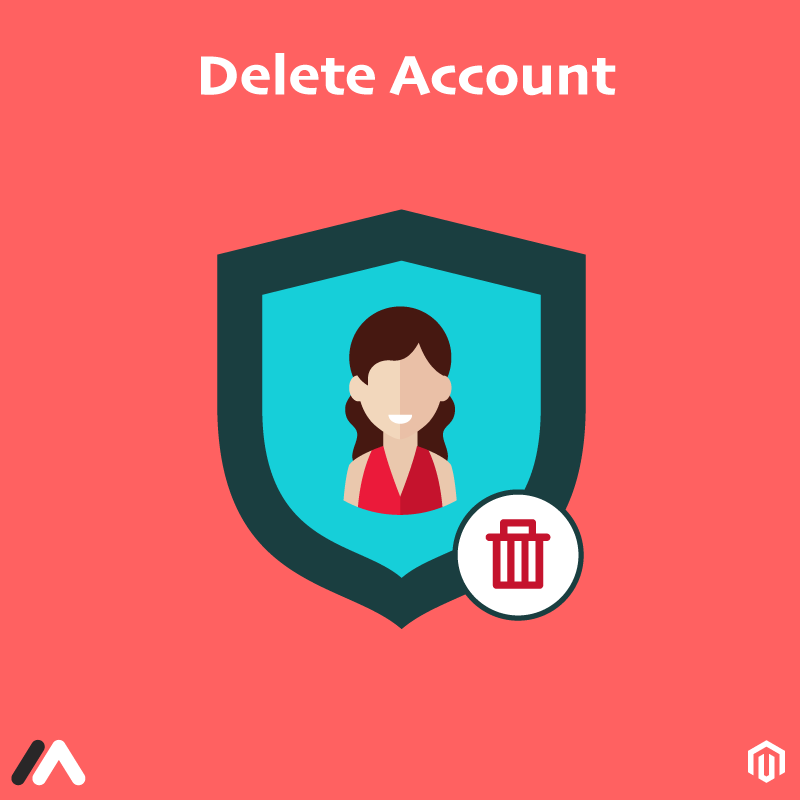 Once the delete account request is sent, customers get delete account confirmation Email to their registered Email ID to confirm permanent deletion of their Magento customer account. Two stage verification process for Magento account deletion for more security. It is human tendency to attract to something free and taking advantage of this attitude, E-commerce store offers free shipping service for those orders that qualify for it. Such an offer tempts the customer to increase their average cart value which benefits the store in terms of sales. To implement this strategy, Meetanshi has come up with Magento 2 Free Shipping Bar extension. Magento 2 Free Shipping Bar extension automates the calculation of cart amount total and the amount needed to qualify for free shipping. It will display a message such as "Add more $15 to be eligible for Free Shipping!". The Free Shipping Bar for Magento 2 is a sales driver! The customer will be encouraged to buy a product worth of the amount needed to avail free shipping service to avoid paying for shipping and instead get something of use. The module also allows customizing the layout of the bar and display a customized message with updated calculations! Persuade customers to buy additional items in the temptation of free shipping service. Set the threshold value of the cart total to be eligible for free shipping, select groups to enable free shipping bar for and add customized text to be displayed in the frontend. Replace the free shipping notifier bar with a customized success message once the customer's cart is qualified for free shipping. Admin can select one of the three free shipping bar positions to place the bar in the frontend. You can choose to stick the shipping bar while scrolling the page in the frontend. Allow customers to close the shipping bar. Allows admin to include/exclude tax in the displayed subtotal on the message bar. Display the shipping bar either in mobile or desktop or both. Display the free shipping bar on various pages such as home page, category page, search result page, product page, cart page, and checkout page, to increase the urge and effect of free shipping. Select one of the three shipping bar sizes from large, medium and small. Admin can set the delay time to load the free shipping bar after specific seconds of the page load. Easily auto hide the free shipping bar after some specific seconds after the display. 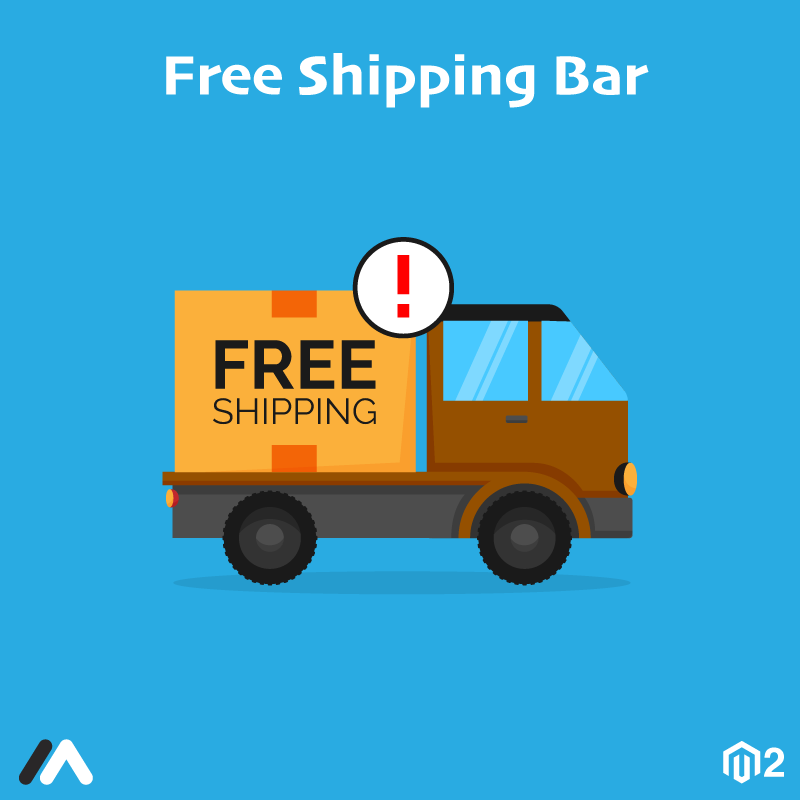 Customize the color, alignment, and font of the free shipping bar and the success message. The extension facilitates to add one of the numerous animation effects for the free shipping bar. Admin can add custom CSS. Communicate with your visitors directly! Customers may be doubtful about the products while an online purchase. They may have an inquiry regarding the service you offer or the features of your products. Instantly providing them a platform for communication to solve their doubts increases the chances of a purchase. WhatsApp is the best platform for instant communication as it is easy to use and widely popular. Meetanshi have developed Magento 2 WhatsApp Contact extension to let visitors in Magento 2 store contact the store owner via WhatsApp! 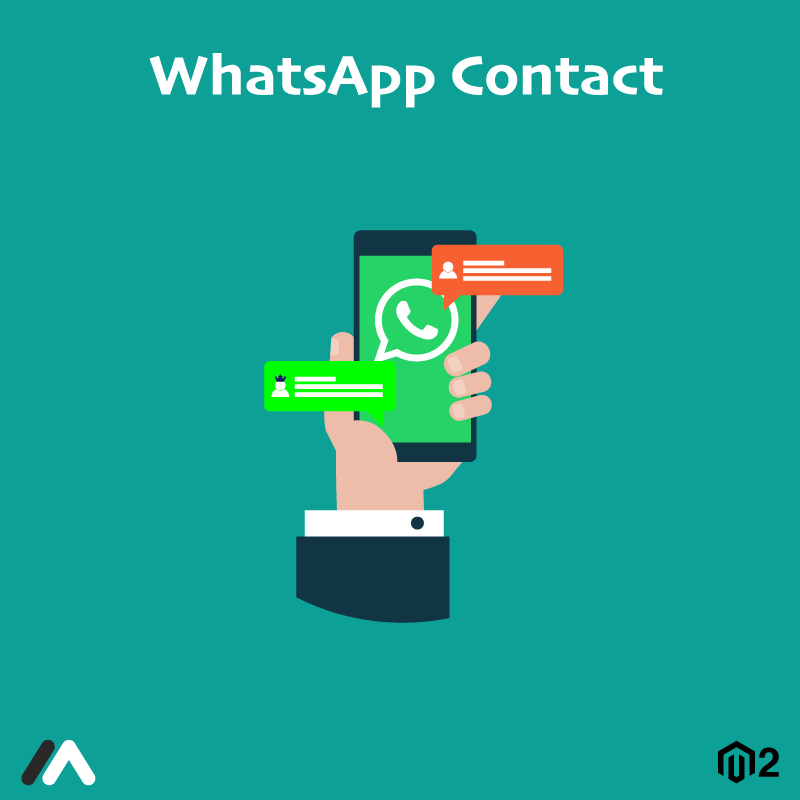 Magento 2 WhatsApp Contact extension lets the store owner have a direct communication with potential customers. It gives them a chance to convince for conversion. Also, getting instant replies for their doubts improves the store's user experience. Customers will find it convenient to use WhatsApp over Emails. Direct chat via WhatsApp gives an impression of personal approach! Option to display WhatsApp Contact button on the desktop, mobile or both. Admin can set default message to start WhatsApp chat when someone contacts him. Specify the mobile number of admin to allow direct contact with the users in the frontend. Admin can customize button hover text, button background color, and icon color to create the button as per the need. Specify the date range to display WhatsApp Contact button in the frontend. If you don't set the range, it will be shown all the time. Set top, bottom, left and right position in pixels to position the WhatsApp Contact button in the frontend. Choose one of the sixteen button animation effects to highlight contact button and to make it look better. Admin can select to allow visitors close contact button if they don't need it. Compatibility with Whatsapp web, app, and the business app. Magento 2 WhatsApp Share by Meetanshi let visitors share products via WhatsApp in a single click with their loved ones, promoting them to potential customers! WhatsApp is one of the popular messaging apps. It is quite popular due to its free availability and easy user interface. To take advantage of such a popular platform in an E-commerce business is effective! As a result, Meetanshi has developed Magento 2 WhatsApp Share extension for Magento 2 store owners. The module allows visitors to share the products with their friends and family via WhatsApp instantly! Promote the store products free of cost! No extra efforts needed to reach out to potential customers. Use Meetanshi's Magento 2 WhatsApp Share extension and let the store visitors share the products. The people with whom the products are shared will be tempted to visit your store and know about the product that their loved ones shared with them! The extension will allow sharing the product details such as URL, price, discounts, coupon codes, description, etc. Moreover, the admin can also track the traffic gained by WhatsApp sharing with Google Analytics by enabling UTM tracking code in the URL. Gain more traffic of potential customers in Magento 2 store and increase conversions with minimum efforts using WhatsApp Share extension for Magento 2! Customers can share the store products along with the description, name, price, discount, special price, URL, etc. with their WhatsApp contacts. Admin can enable or disable the extension in 3 ways: globally, product specific or category specific. Option to show sharing button only on product pages by disabling it on the category page. Choose WhatsApp share icon or image to display in the frontend. Encourage visitors to visit and purchase store products by sharing coupon code or special price via WhatsApp! Set custom message for the discount coupon code and special price. The extension allows WhatsApp Sharing through both the mobile app and web versions. Share Magento 2 store products with Whatsapp groups and broadcast lists as well. Enable UTM tracking code to analyze the traffic from WhatsApp sharing in Google Analytics. The extension allows sharing short URLs using bit.ly. Magento 2 Product Attachments extension enables admin to upload files on the product page that will help visitors to understand the products and inspire them for the purchase. For an E-commerce store owner, it is a challenging task to convince the visitors for conversion as they won't be able to check the products physically. The store owner needs to put an extra effort to make their visitors understand the products' features and other details. Meetanshi developed Magento 2 Product Attachments extension for Magento 2 store owners that allows them to upload multiple files on the product page. It helps visitors get more information about the product such as license, demo, user guide, features, warranty cards, prices, etc. Give the best customer experience in your store! Let customers check every detail about your product before they spend their money. Allow them to check PDFs, document files, audio and video files, presentations, image files, zips, flash files, etc. that explains what exactly do you offer! 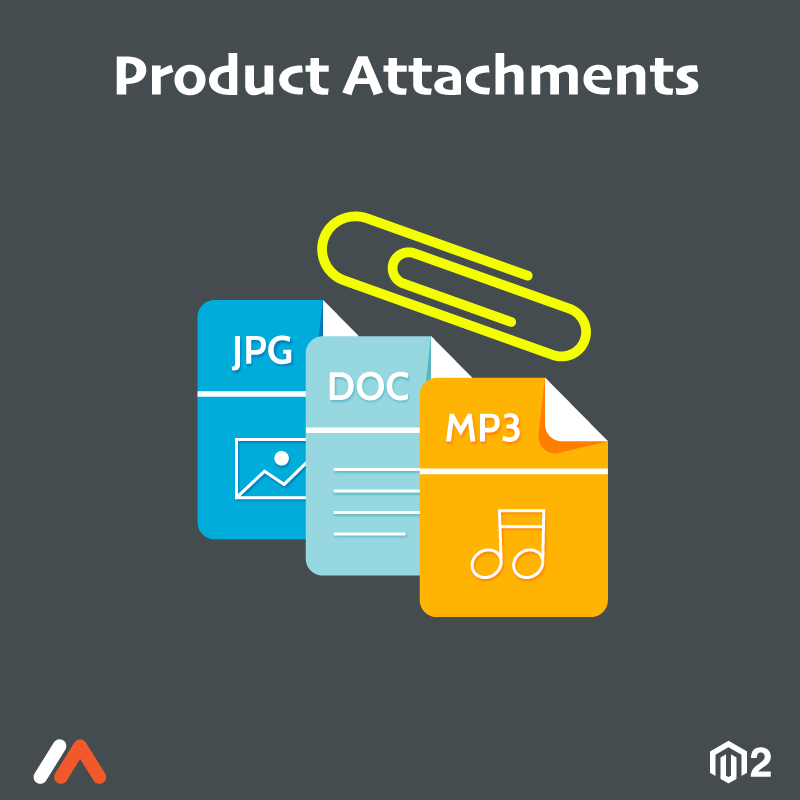 Use Magento 2 Product Attachments module to upload these files on any product page or CMS page. The Magento 2 Product Attachments module allows making your product page informative and convinces visitors for conversion, hence benefitting your business! Attach any number of files in product and CMS pages. Support for multiple file formats. Drag and drop files to product grid. Place the files on the product page that is easily accessible to viewers and hence improve the user experience. Display the icon image to let the visitors know the type of file they'll open or download. Enable or disable the display of files from the backend. Allows keeping track of downloaded files. Allow file downloads according to the customer groups which motivates the customers to signup/login. Magento GST India extension by Meetanshi automates the GST calculation according to the Indian government rules in Magento store. The Indian Government introduced Goods and Service Tax(GST) to replace all other indirect taxes in the country. It is compulsory for businesses to implement the GST tax. Owing to its complex structure, Meetanshi has developed Magento GST India extension to assist Magento store admins to implement GST in the store. Magento GST India extension integrates GST with Magento store. Automate the tax calculation in Magento store as per the Indian GST rules. Apply GST to the price of the product; a consumer who buys the product pays the GST in addition to the product price which is implemented with the module. The business location and tax rate slabs play an important role in GST implementation but the module takes care of it. Moreover, the order documents like invoice, shipments, credit memos also include GST bifurcation in detail. Add GSTIN, CIN and PAN number to display in various order documents. Admin can set and display the sales price of product inclusive or exclusive of the GST. Set minimum product price to apply the set GST rate. Set GST rate for the products having lesser price than the minimum set amount. Business location based CGST-SGST and IGST calculation. If the business origin meets the destination location, CGST- SGST will be charged else IGST gets charged on product purchase. Automate the calculation of SGST, CGST, and IGST and add to Magento order subtotal. Upload signature PDF and text to display in order invoice PDF. All the order documents i.e order view, invoice, shipment, credit memo, Emails, and PDFs include the detailed bifurcation and explanation of GST. Invoice PDF includes the state name and code. The calculation of the shipping GST will be implemented considering the same rate set for GST. 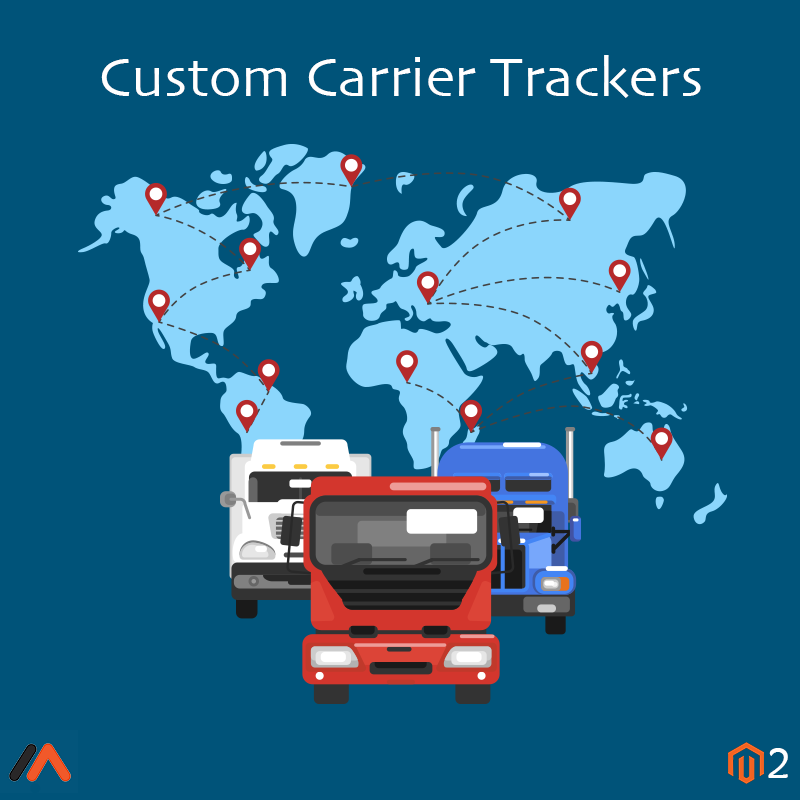 Add up to 15 new carrier trackers for your customers in your Magento 2 store with Magento 2 Custom Carrier Trackers extension. 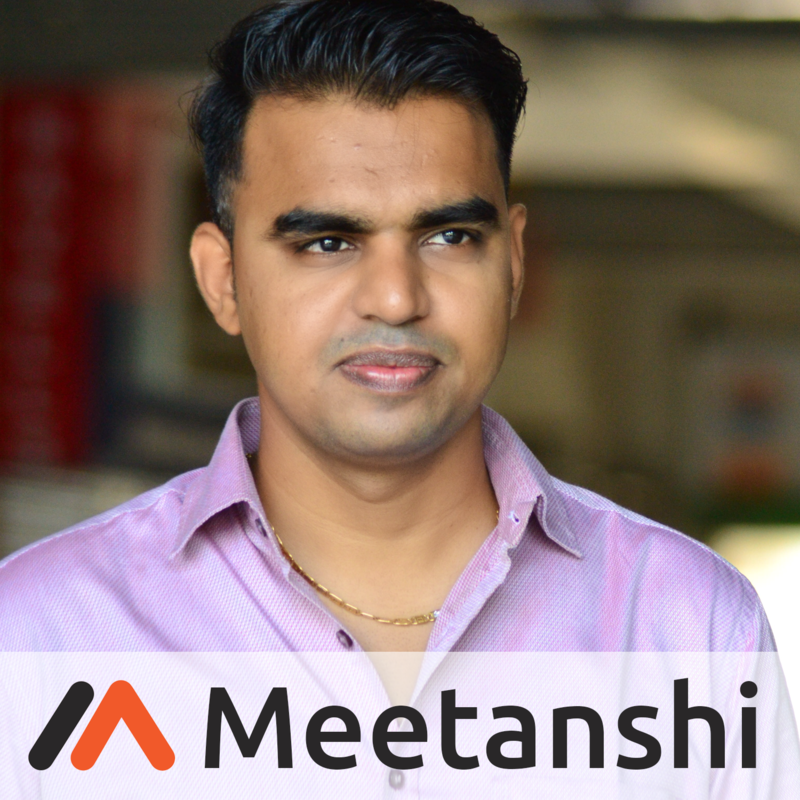 Magento 2 Custom Carrier Trackers by Meetanshi enables store owner to offer up to 15 custom carrier trackers to customers! Default Magento provides four shipping methods only. To overcome this limitation, use Magento 2 Custom Carrier Trackers. Easily allow customers to track their shipment from the link received in the mail. Also, admin is allowed to configure the name of the tracker and the URL according to the need. Get the best out of the module and enhance the user experience of your store! Add up to 15 carrier trackers in Magento 2 stores. Configure each tracker just by changing name and tracking URL as per the requirement. Clicking "Track Order" from Magento 2 admin directly opens link of tracking URL rather than a popup. Customers can see tracking URLs in their "My Account" section. Tracking number and postcode is automatically replaced once it has been sent to customers in Email. Allow customers to track their shipments directly from shipment Email they receive. Easily disable or hide default tracking method of Magento. Integrate WorldPay payment gateway to capture online payments securely in your Magento 2 store with Meetanshi's Magento 2 Worldpay Payment extension. E-commerce business is under constant threat of security issues due to online payments. If proper measures are not taken, it leads to a loss of business. Worldpay is a secure payment gateway which can be integrated with Magento 2 store to avoid any security breach. Meetanshi developed Magento 2 Worldpay Payment extension to enable Magento 2 store owners to do so! 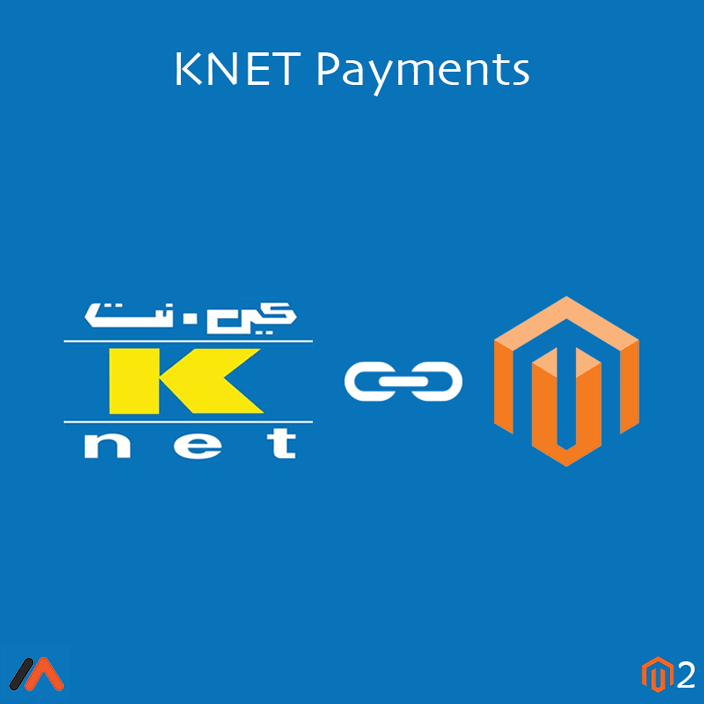 Magento KNET Payments extension by Meetanshi enables capturing secure payment by integrating Kuwait's KNET Payment Gateway with Magento. Security is of prime importance in an E-commerce store. Payments have to be processed in such a way that there is no compromise with the customers' data. KNET payment gateway is a popular payment gateway in Kuwait. 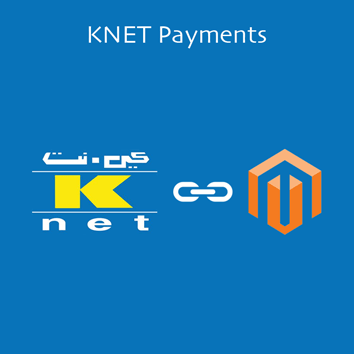 Kuwaiti Magento stores must offer the KNET payment option in their Magento stores. Meetanshi developed Magento KNET Payments extension to integrate the KNET Payment Gateway with Magento. It ensures safe payment through debit cards. Magento KNET Payments extension ensures secure payment process as it redirects the customers to the payment gateway to enter debit card details and proceed payment. SSL certificate is required to integrate Magento store with KNET Payment Gateway. 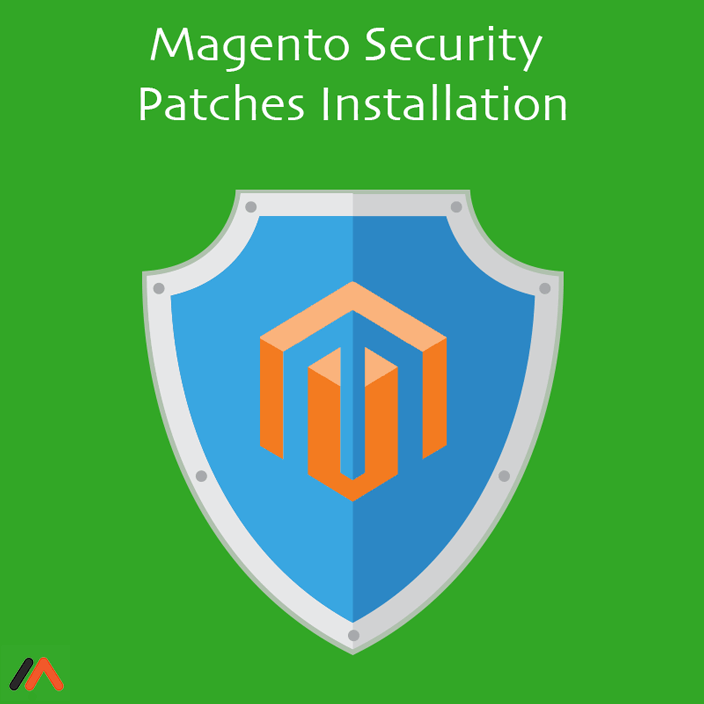 Accept secure online payments in your Magento stores. Select the language of payment processing. KNET payment gateway securely processes debit card data for payment capture and don't store any information on the gateway. Customers can choose KNET payment method on the checkout page and get redirected to payment gateway once selected. Gain your customers' trust with the secure payment system. 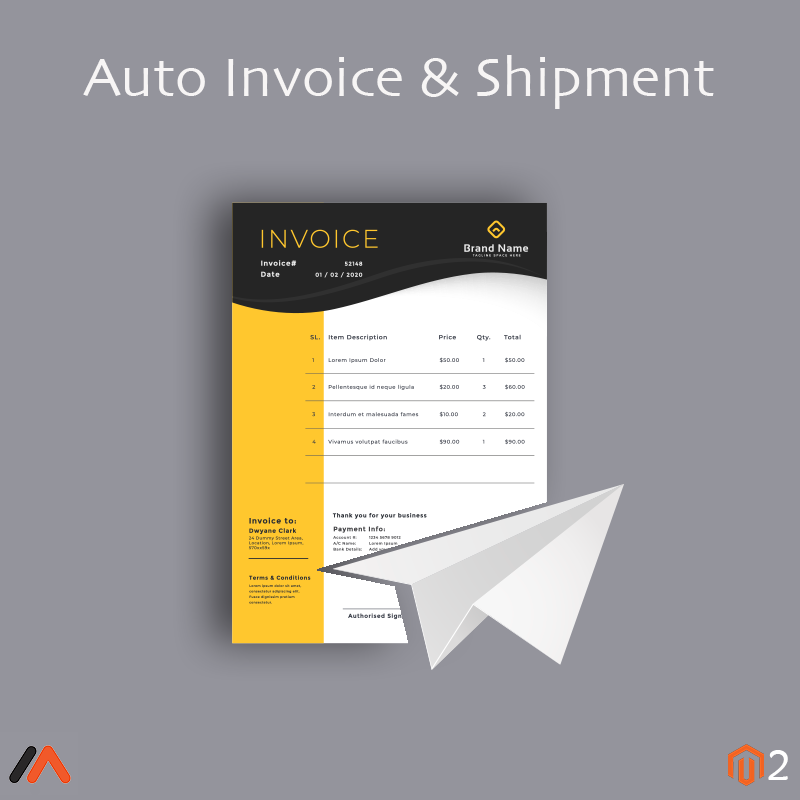 Magento 2 Auto Invoice & Shipment enables to automatically create Magento 2 invoices and shipment to simplify the Order processing system. Generating the invoices and shipment manually in default Magento is a time-consuming task and also requires human resource. Also, the manual system is not efficient when there is an increase in the number of store customers. Meetanshi developed Magento 2 Auto Invoice & Shipment extension to overcome this problem! Magento 2 Auto Invoice & Shipment extension automates the process of Magento 2 Invoice and Shipment creation. Save your time and improve the user experience of the store with the help of the module. Don't make your customers wait for the confirmation Emails of invoices and shipments and order status to change to complete. Each of these mentioned processes is automated by the module. It sees to the tasks such as creating the invoice and shipments, sending the invoice and shipment emails, and capturing payments! Enable/Disable Auto Invoice & Shipment for Magento 2 stores. Provides compatibility with multiple payment methods of your Magento 2 stores. Improves trust among customers with immediate invoices. Auto changes order status to complete once invoice and shipment generation gets completed. It sends invoice Emails automatically once created in the backend. 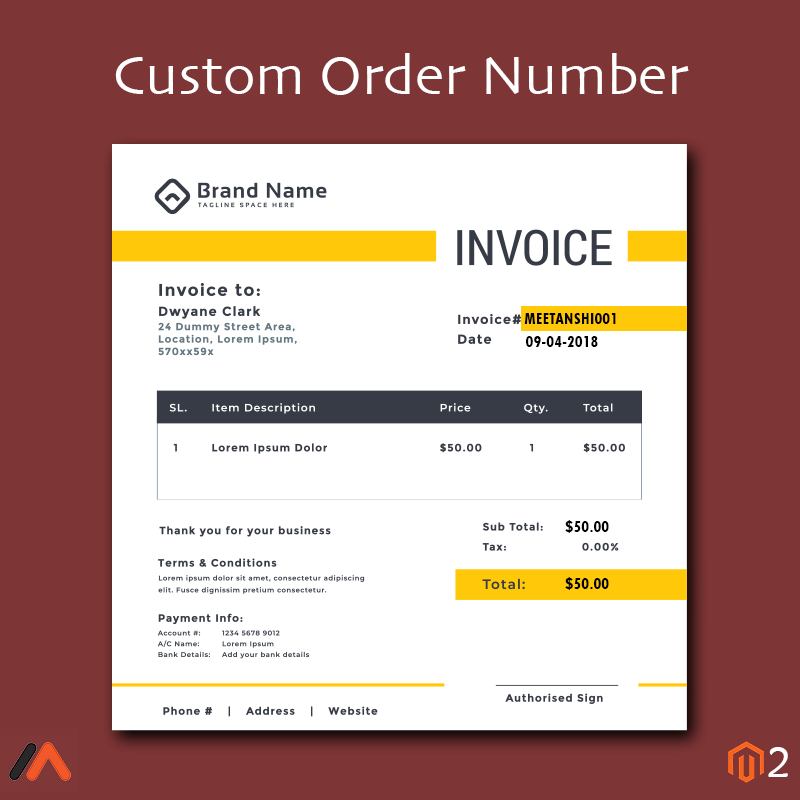 Magento 2 Custom Order Number by Meetanshi is a perfect tool to customize the order numbers and much useful in managing the database numbering! Meetanshi's Magento 2 Custom Order Number extension is extremely useful in customizing the order numbers by prefixes, suffixes, alphabets, counter or any arbitrary numbers as per the business need. The Magento, by default, has a constant pattern which is complex to follow and is a hindrance to the user-friendliness of the store. Easily manage the database with Magento 2 Custom Order Number module. 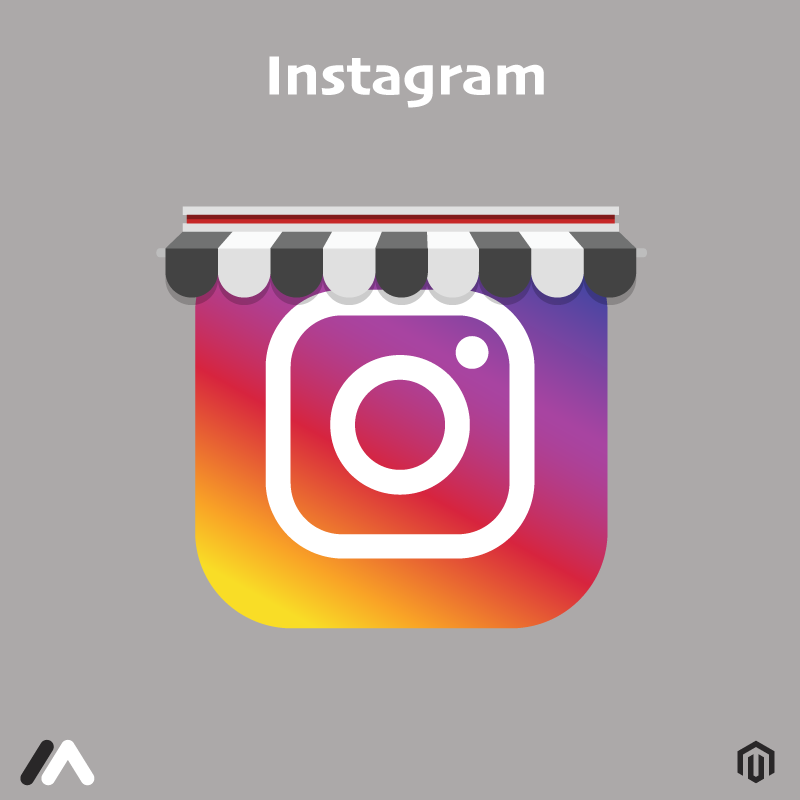 Attract visitors with higher order number creating an impression of more sales in the store with the help of the module. Along with the Order number, the extension allows customizing the sales related data like invoices, shipments, credit memos etc. Prevent revealing critical information to the competitors that can be easily figured with the default Magento order numbering system. Control the Order Number system in the Magento 2 store with Magento 2 Custom Order Number extension developed by Meetanshi. Easily customize order numbers, invoices, shipments and credit memo numbers. Allows specifying starting number and length of the order number. Provides flexible numbering formats to use such as letters, prefixes, suffixes, date and time variables, letters etc. Reset counters on a daily, monthly or yearly basis. It also supports increment intervals for order numbers, for example, the increment of order number with 3 digits. Random order numbering formats help to hide important business data from competitors. Easily comply with local or legal requirements by customizing order numbers. Magento 2 eWay Payments extension by Meetanshi allows store owners to integrate eWay payment gateway with Magento 2. Capture secure online payments through credit cards with the help of Meetanshi's extension! 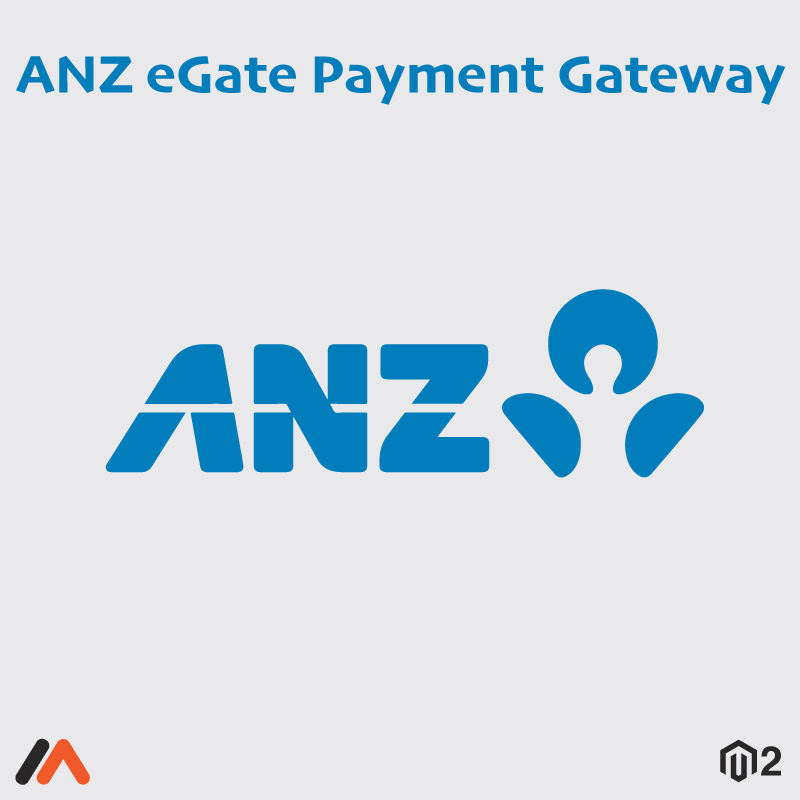 eWay is a popular payment gateway in Australia. It is a safe way for online payments. Integrate the extension in Magento 2 store after creating an account in eWay and receiving the registration API key and password. Magento 2 eWay Payments extension allows accepting one off payments. There is a facility for customers to save the credit card details to ease their task at the time of next purchase. Also, enjoy the enterprise anti-fraud protection for Magento 2 store! The module allows admin to process a full or partial refund, capture authorized transactions and process orders manually. Enable/Disable the eWay Payment extension from the backend. Enable Direct Connection or Responsive Shared Page method for transaction process. The direct connection method is a simple single side server call. It supports Visa Checkout and AMEX Express Checkout. 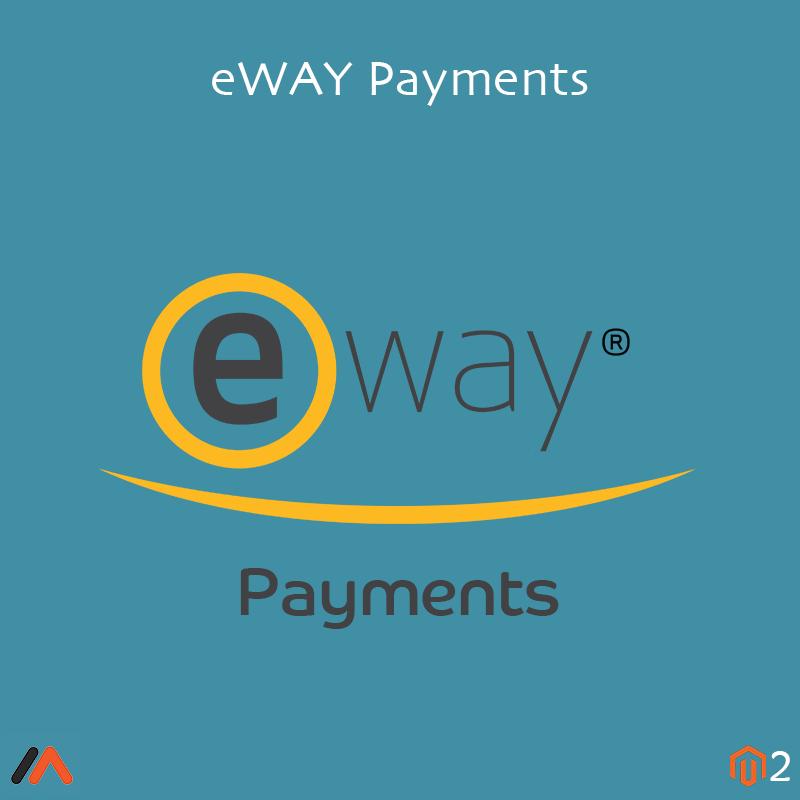 The Responsive Shared Page method includes payment forms hosted on eWAY's PCI DSS compliant.The process protects the merchant from handling the payment process. Customize the label of payment method for the frontend. Option to enable the sandbox mode to test the transaction process. Live mode is enabled for the actual payment captures. The module supports the authorize/authorize and capture payment actions. The module provides debugging mode support. Supports all the major credit card types such as Visa, Master Card, JCB, Diners, etc. Admin has the option to select the list of allowed countries to enable eWay payments from the backend. 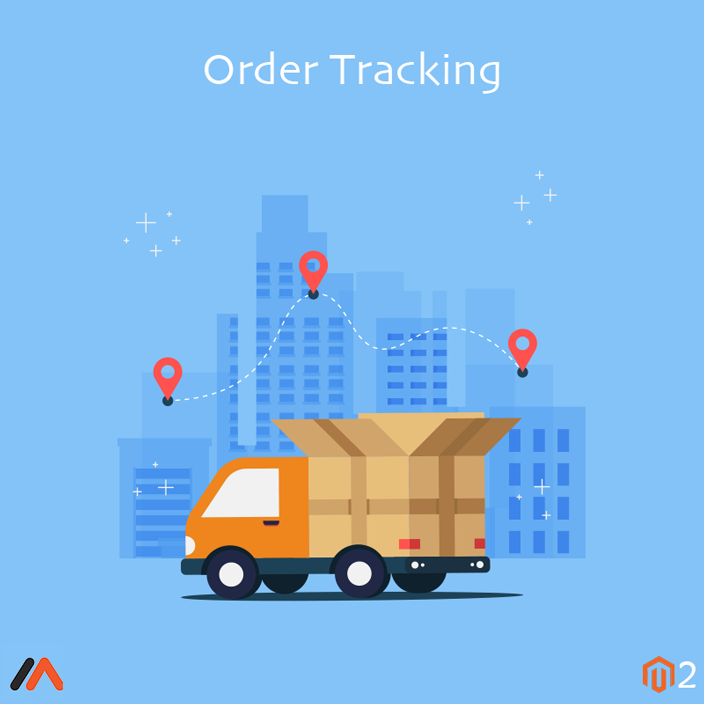 Magento 2 Order Tracking extension by Meetanshi lets your customers track the current status of their order with Order ID and email ID. Online shopping Customers who have chosen to do online shopping always wants to know when their product will arrive as they didn't have the chance to physically interact with the product and now they are eager to do so. Meetanshi's Magento 2 Order Tracking extension allows the store owners to provide the facility to their customers to track the order. Such facility provides assurance to customers and hence build their trust. Magento 2 Order Tracking extension by Meetanshi allows customers to track their order with Order ID and Email ID, without having to log in. Having such facility will reduce customers' concern about the delivery and encourage them to do more online purchase. The module allows Admin to position the order tracking link in the top link section and the menu. Also, the extension facilitates to send order tracking link in order confirmation Email. The customers can track their orders without logging in. Customer needs to provide the order ID and Email address to get the tracking status. Tracking order link can be enabled in the top link section and top menu. Allows admin to customize the validation message for invalid order ID, Email ID or order tracking unavailability. Option to send order tracking link in order confirmation Email to customers. The extension improves the customer engagement even after the purchase is made. 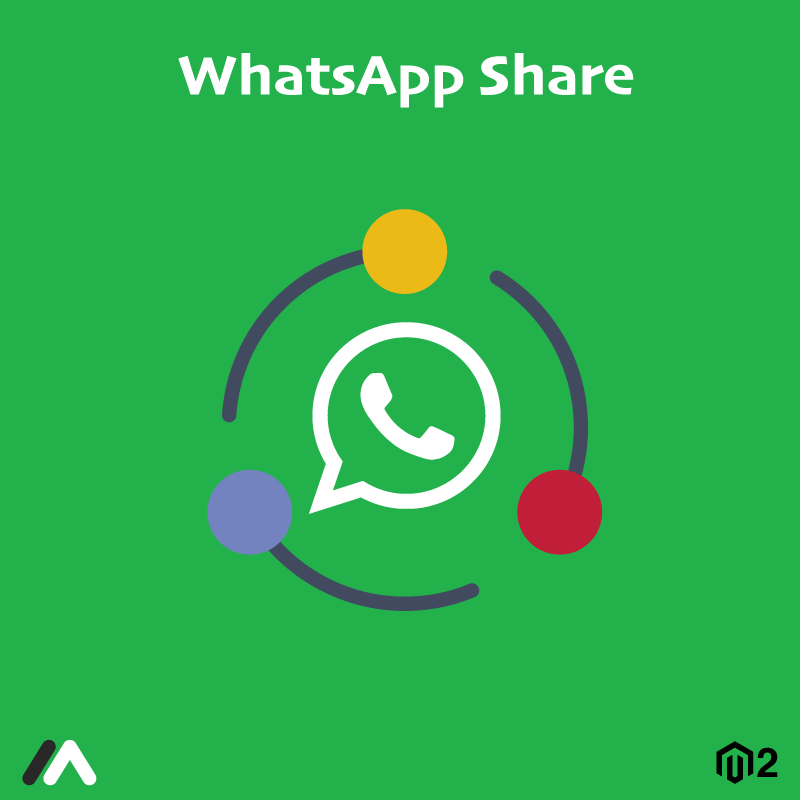 Magento WhatsApp Share extension by Meetanshi lets you embed a Whatsapp share button to let customers share the product with its details quickly to the WhatsApp contacts. WhatsApp is a top rated messaging app. More than 1 billion people use Whatsapp daily. Such large numbers denote a dedicatedly engaged user base. Magento store owners must grab the opportunity lying here! 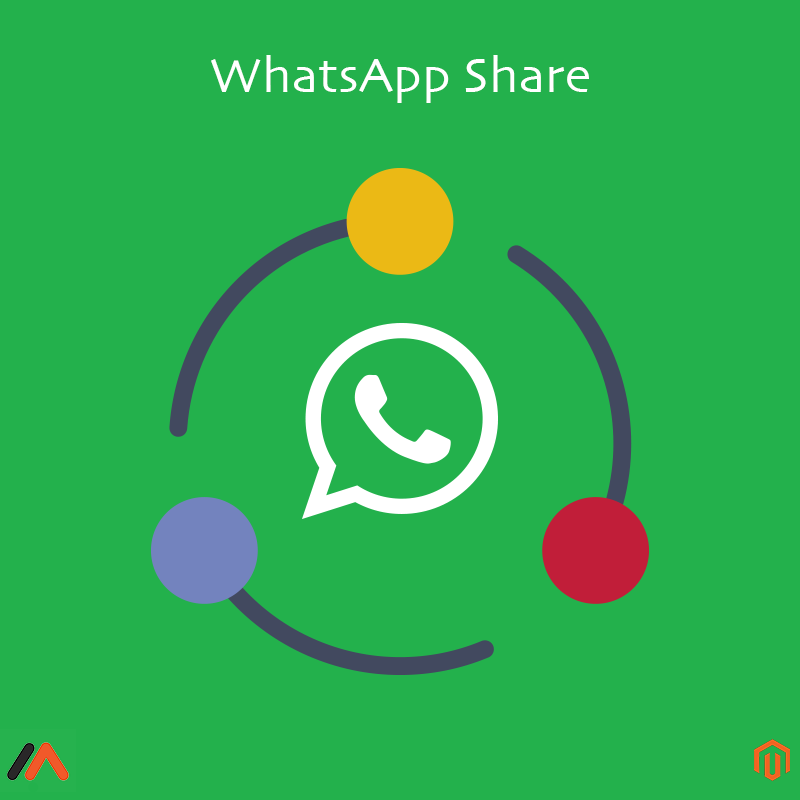 Metanshi offers Magento WhatsApp Share extension to promote the products and services through the most popular messaging app - WhatsApp. 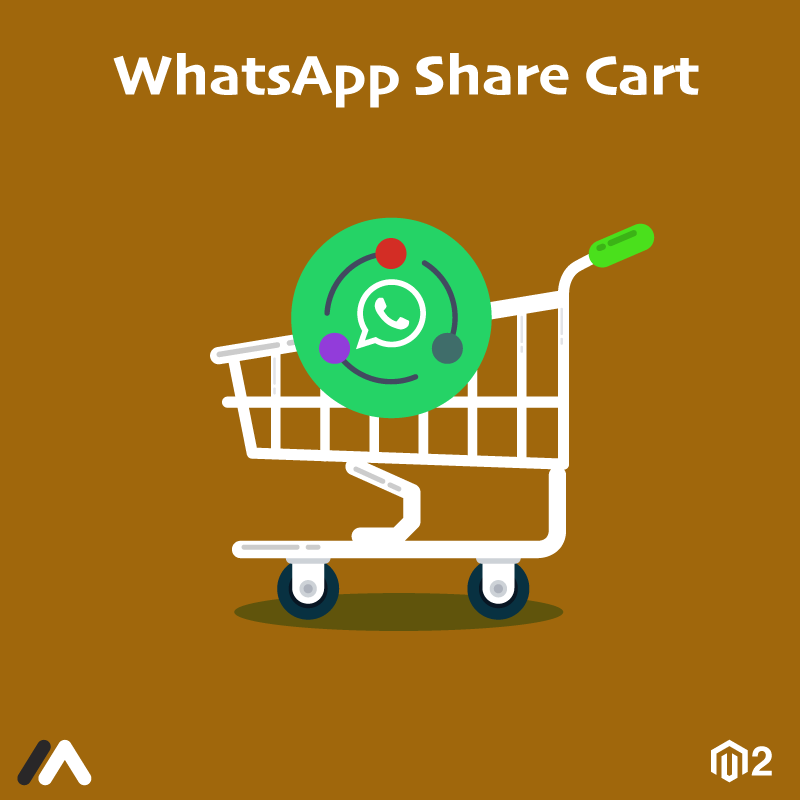 Magento WhatsApp Share enables a WhatsApp Share button on Category Page and Product Page, through which the visitors can share your store's products with its details like name, price, description, discount code and URL on WhatsApp very easily! It will help in marketing your products to a large set of potential customers. Prompt the visitors to share the products with their friends and family by making the WhatsApp Share facility available to them quite easily and thus leverage their visit for your purpose! The Magento WhatsApp Share extension comes with useful features like including custom messages when the product is shared, enable UTM Tracking code, URL sharing using Bitly URL shortener and much more! Allow sharing product details like product name, short description, price, discounts and special price if available, URL, etc. Three ways to enable WhatsApp Share: Globally, Category-specific, and Product specific. While choosing category or product specific WhatsApp share option, admin can enable the option of particular category or products. Enable or Disable the Whatsapp Share button on the Category page. Option to use icon or image for the WhatsApp Share button. Offer exclusive discounts for the purchase which is made from the shared link. 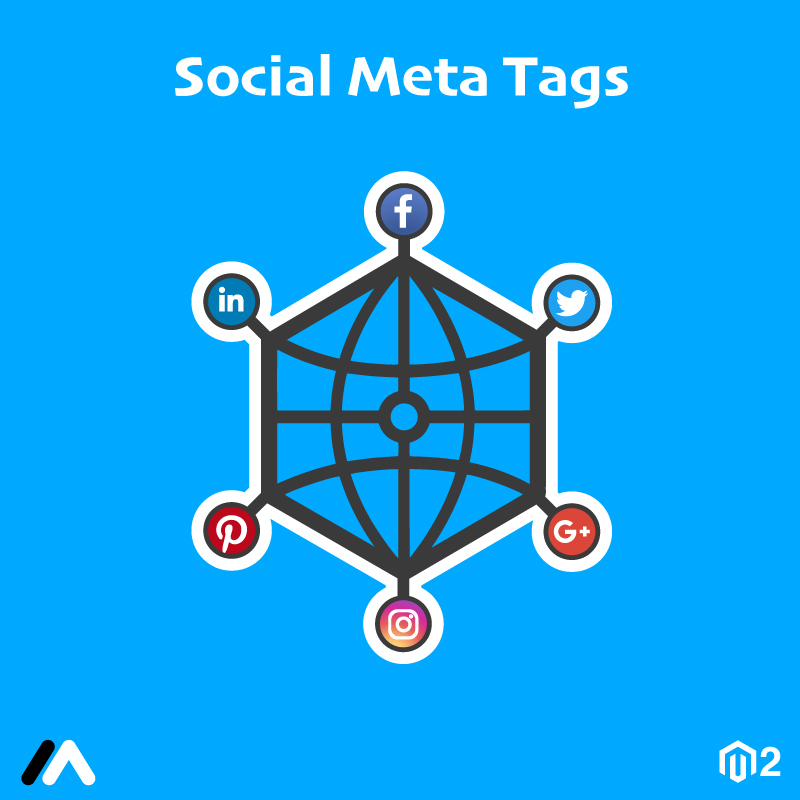 Allows sending UTM tracking code to the product URL that helps analyze visits and conversions from the links shared with WhatsApp in Google Analytics. Supports product URL sharing using BitlyURL shortener. Create a free account in Bitly and get the API key. Support for mobile app version and WhatsApp web version. 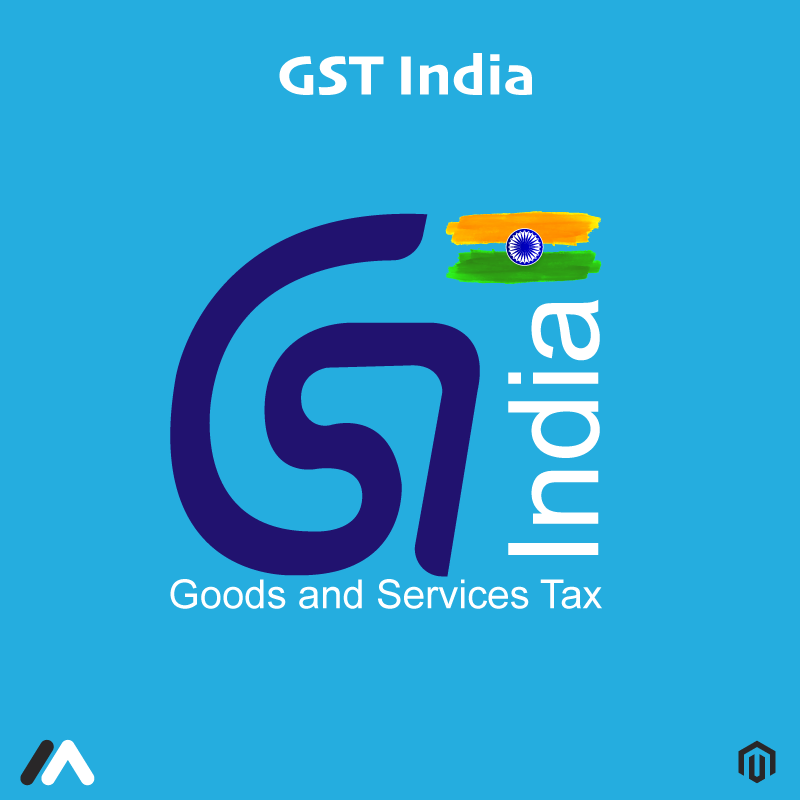 Magento 2 Indian GST Integration Extension auto-calculates tax rates for your Magento 2 store products, according to Indian GST standards, and display the tax amounts on the front end. GST is the indirect tax levied in India that has replaced many other indirect taxes. E-commerce stores have also been affected and it needs to be made compatible with the GST rules. 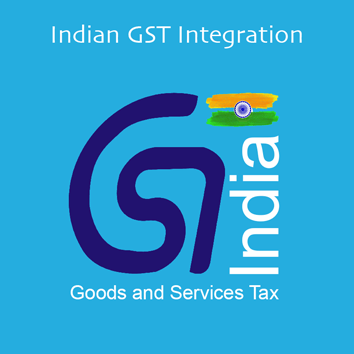 To serve this purpose, Meetanshi offers Magento 2 Indian GST Integration extension. 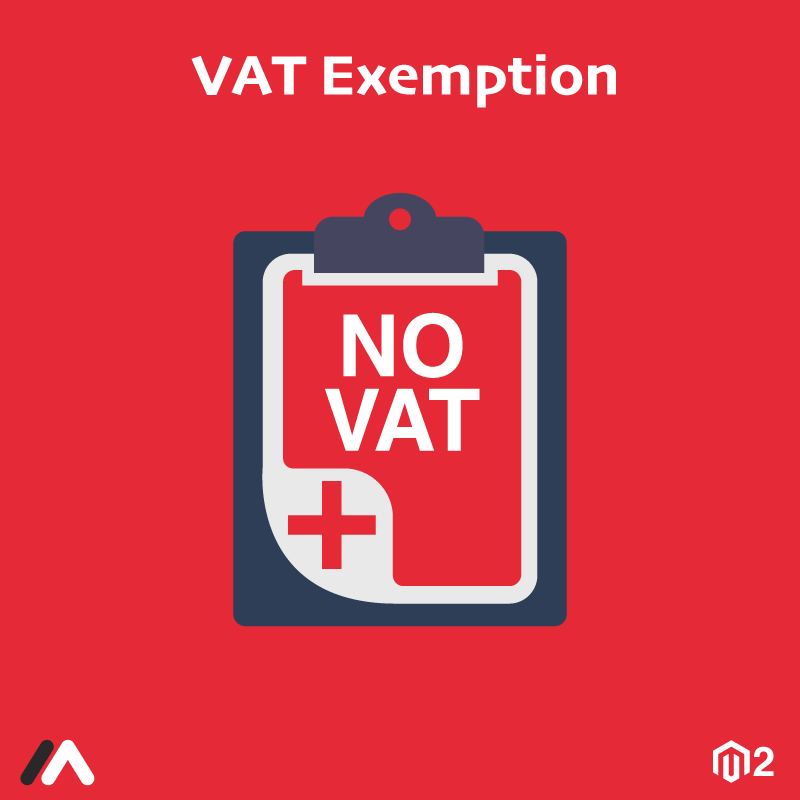 The extension is useful to calculate the tax rates and rules for the products and services of your Magento 2 store by setting GST as the default tax. The module takes care of the tax rates meeting the GST standards mentioned by the Indian Government. Show GSTIN number in all the order details. Option to add CIN number to display in various order documents. Option to add PAN number to display in various order documents. Set minimum product price for applying GST rate. Option to Apply GST rate below specified minimum product price. Set the business origin to apply IGST i.e. Inter State GST. Detailed view for invoice, tax rates in order, credit memo, new order Email, shipment & PDFs. SGST, CGST, and IGST calculated automatically based on product selection and displayed in Order Subtotal. Magento 2 Canada Post Shipping enables integration of Canada Post API with Magento 2. Facilitate the shipping method favorable to the Canadian customers in your store. Get the most out of the Canada Post Shipping API. Render shipping services from Canada to all around the globe. 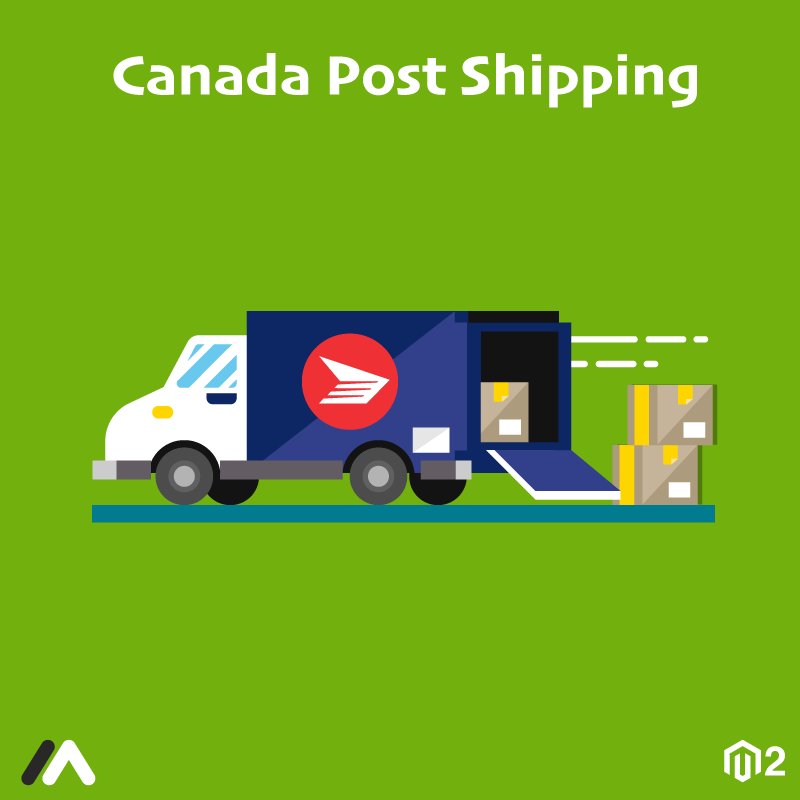 Meetanshi brings Magento 2 Canada Post Shipping extension to integrate Magento 2 with Canada Post Shipping API as it is the favorable shipping method by Canadian customers of E-commerce. The extension allows calculating live shipping cost based on shipping source and delivery destination. Canada Post accurately estimates shipping charges on the ground of the details recorded like cost request, postal code, shipping label printing, cancellation, handling charges, pick-up & delivering timings, etc. Admin can enable/disable the Canada Post Shipping Method from the back-end. Customers can choose the shipping method from the available multiple shipping methods options at the checkout page. Set rate type, container type, and size for accurate calculation of shipping costs. Admin can set the list of specific countries allowed for the shipping methods. 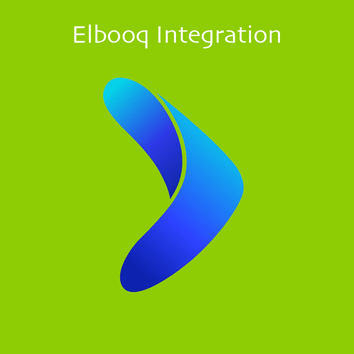 Magento 2 Elbooq Integration extension enables integrating your Magento 2 with Elbooq Mobile Payment Gateway. You can rely on the module to capture online payments securely in your Magento 2 stores. Secure online payment is a must feature in E-commerce. You may not want trust issues or lower sales due to insecure payment methods as it will affect your business. To avoid that mess, Meetanshi brings Magento 2 Elbooq Integration extension that enables integrating Magento 2 with Elbooq Mobile Payment Gateway for your Magento 2 stores. The extension will help enhance and capture online payments safely. Customers are asked to choose the Elbooq Payment method at the end of the checkout process, the store then sends a request and proceed payment capture. Facilitates accepting secured and fast online payments. In China, Alipay is the most popular Payment Gateway. To capture the payments from customers in China, Meetanshi offers Magento 2 Alipay Integration Extension which allows you to integrate Magento 2 with Alipay Payment Gateway. 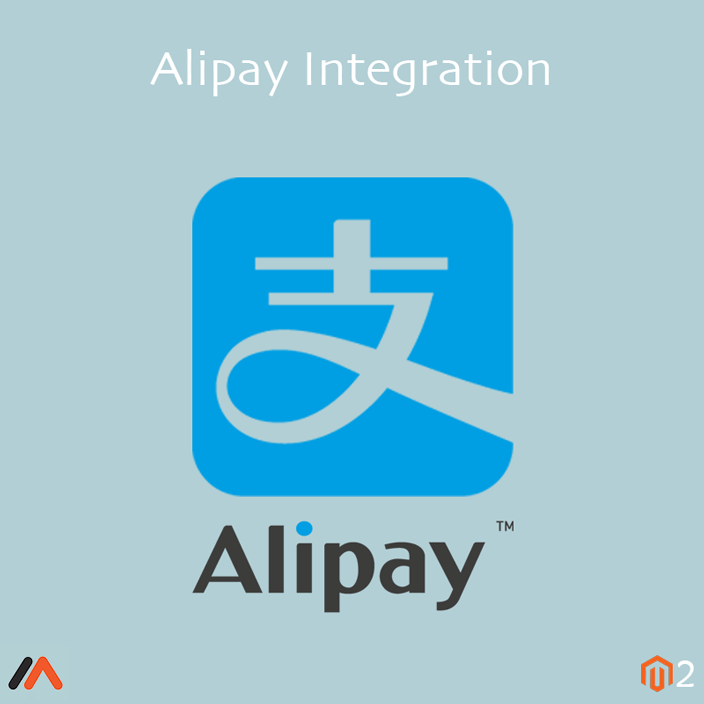 Provide better convenience to your Chinese customers for payment by using Magento 2 Alipay Integration Extension. Knowing the customer’s demand is vital to a store’s revenue. The store owner must be aware of the products which are in stock or not as well as what products customers wish to buy. 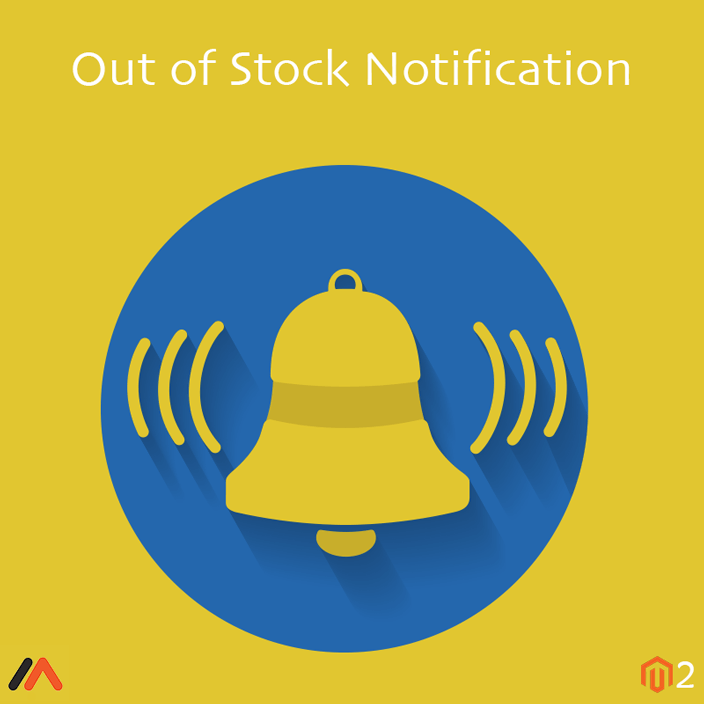 Meetanshi’s Magento 2 Out of Stock Notification extension allows store owners to do so. The extension lets customers subscribe to the products which are out of stock and notify them when the products are available again. The store owner can keep track of the subscriptions and analyze it to increase the availability of the products and enhance user experience. Allow store visitors, guests and customers to subscribe to products which are out of stock. Individually track subscribers of each product for stock notifications. Includes option to allow subscription for notifications based on customer groups. Allows customers to edit, update and delete subscriptions from their “My Account” section. Enable single time notification to send alerts to Customers. The extension supports out of stock notification for all default Magento 2 product types. Allows the Store Owner to export the List of Subscribers for Out of Stock Products. The value of attributes like location, Item quantities, weight, etc. may vary from customer to customer. Depending on this fact, the customer will ask for varied shipping options. 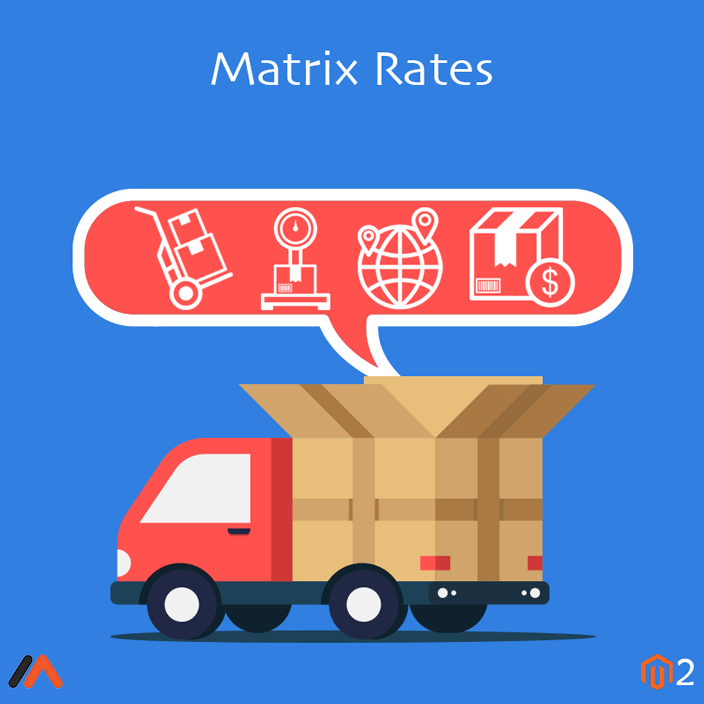 Magento 2 Matrix Rates extension by Meetanshi lets your customer choose shipping options based on any variables that the store owner might want to add. Customer satisfaction which is very much Important can be achieved by facilitating the best-suited shipping options with the help of Meetanshi’s Magento 2 Matrix Rates extension. Moving to Magento 2 is essential if you want to take advantages of latest creativities in E-commerce world. 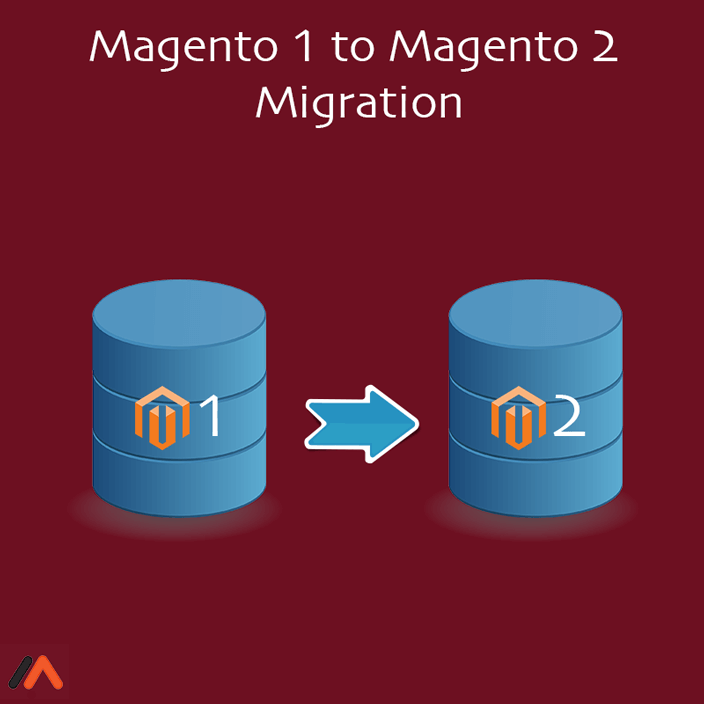 While it can be a complicated process, choosing Meetanshi’s Magento 1 to Magento 2 Migration Service will ease your task. Sit back and relax while we will do it for you without any data loss and almost zero downtime. •	Getting store access details of your current Magento version, backing up of the store and preparing a staging environment. •	Migration of your Magento store to the latest Magento 2 version and solving issues which take place while performing the upgrade. •	QA testing and verification. •	Publication of all new Magento 2 store to live environment. Take the migration service now for a user-friendly interface, flexible architecture, better admin panel, mobile friendly designs and theme layouts and much more. 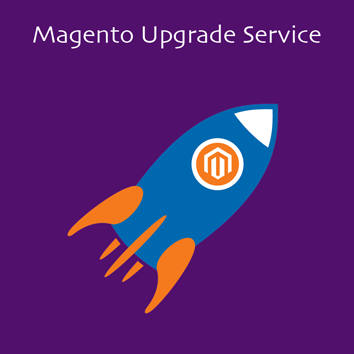 Magento Upgrade Service by Meetanshi provides professional help in upgradation with guaranteed security, no data loss, and zero downtime. Magento is a popular platform for online E-commerce websites. Magento developers keep upgrading Magento and Magento store owners need to keep their stores updated to sustain in the market and have a secure website. •	Enjoy extra functionalities and improved features for your store. •	Protect your store from online susceptible malware or hacking. •	Take advantage of built-in SEO features in the upgraded version. •	Better flexibility and scalability. •	Ability to use custom extensions. Why choose us for Magento upgradation? Choosing expert help is always better than done by a layman. We have expertise in upgradation of Magento Community and Enterprise edition. Moreover, our expert will perform QA testing and deliver the service in almost zero downtime with all working functions and features with the help of which you can foster your online sales. Separate flat shipping rate for each product! Finding difficulty in different flat shipping rates for each product? We have come with Magento 2 extension to solve your problem with shipping rates. The extension provides you the facility to charge individual flat rate shipping for each product. Moreover, it allows you to set default rate to charge when individual shipping per product is not specified. 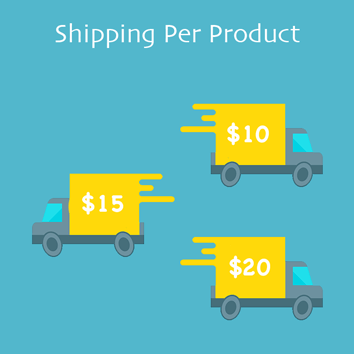 Set individual flat rate shipping charges for each store product. The shipping expense incurred to the store may vary from item to item. The extension will be useful to handle this situation. Option to specify default shipping rate to apply when individual products are not assigned individual shipping charge. To apply the general minimal charge of shipping for regular products you don’t need to specify it exclusively. Just set them to default using the default option of the extension. Option to set custom title and shipping method name for display of this shipping method in the frontend. Use this extension feature to let your customers take the facilities about the different shipping method for which they are charged. For example shipping per product. Select allowed countries to enable shipping per product. Simple as the heading states, only allow shipping per product for the countries you want. Set default error message for the unavailability of this shipping method to users. If you are unable to provide shipping per product to users and you don’t want to be rude in denying it, just set a polite error message using this feature of Shipping per Product extension. So don’t rely on shipping calculators for your shipping charges and try this Magento 2 extension now! 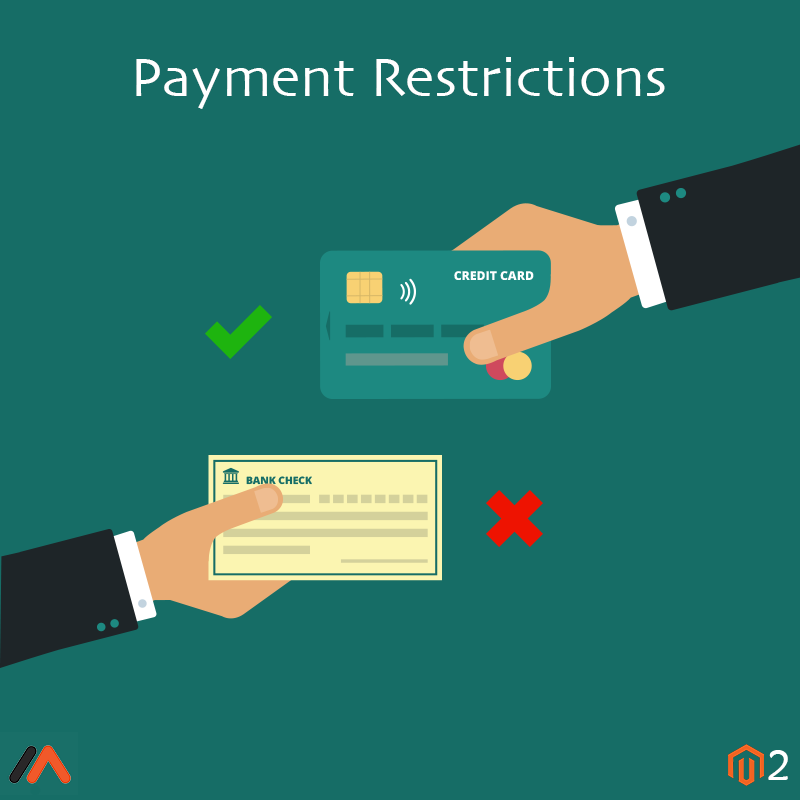 Magento 2 Payment Restrictions helps manage and restrict payments with based on business needs. Meetanshi’s Magento 2 Payment Restrictions extension allows to efficiently manage payments in your Magento store. Customize payment rules with this extension and create a sound payment system. Create flexible payment rules. With this extension, you can provide more facilities to trusted customers as well as restrict to some particular group of users. Set payment limitations based on shipping parameters. If you do not want to facilitate cod or return orders to customers in particular region, the extension is helpful. Restrict payment methods based on shopping behavior of customer groups. Provide more convenience in shopping experience to the loyal customers and hence benefit your store. Use Magento 2 Payment Restrictions to do so. Use customer attributes to restrict payment methods. Create payment restrictions for individual customers based on shipping address, gender, date of sign-ups, etc. Restrict payments based on store views. If you want facilities mentioned above, choose our extension and manage your payments rules. 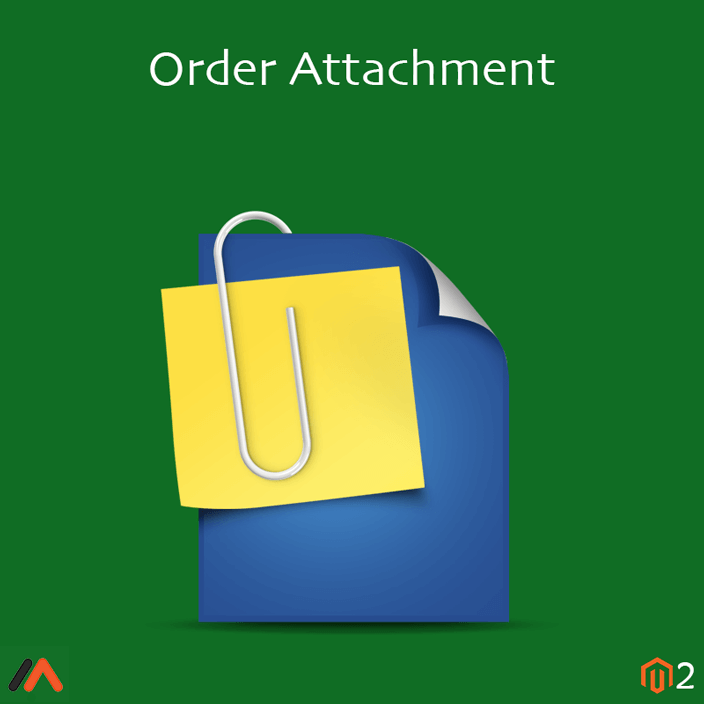 Magento 2 Order Attachment helps manage order data and add attachment along with the corresponding order. Magento 2 Order Attachment extension by Meetanshi offers you the facility to attach items like screenshots, logos, designs, mockups, docs, manuals, instructions, invoices, etc. at the time or while processing the order. This facility is provided to the admin as well as customers. Ease your task of retrieving order data by attaching it right at the time of order with the extension. You do not need to worry about the data which customers have uploaded. Using Magento 2 Order Attachment extension data can be attached to their orders which can be viewed by customers as well as admin. It can also be deleted by customers if need be. •	Add order attachment files from Order View section in Backend. •	Specify the file size and type to be uploaded by customers from the frontend. •	Edit or remove attachment or set it as hidden from the backend. •	Apply Customer Group Restrictions for Attachments. Moreover, Admin and customers can add comments while uploading attachments and can upload multiple files in single order. To receive attachment notifications in the backend, when they are uploaded or modified by customers, the admin has to specify E-mail ids. Ease your task of managing order data with Magento 2 Order Attachment extension. 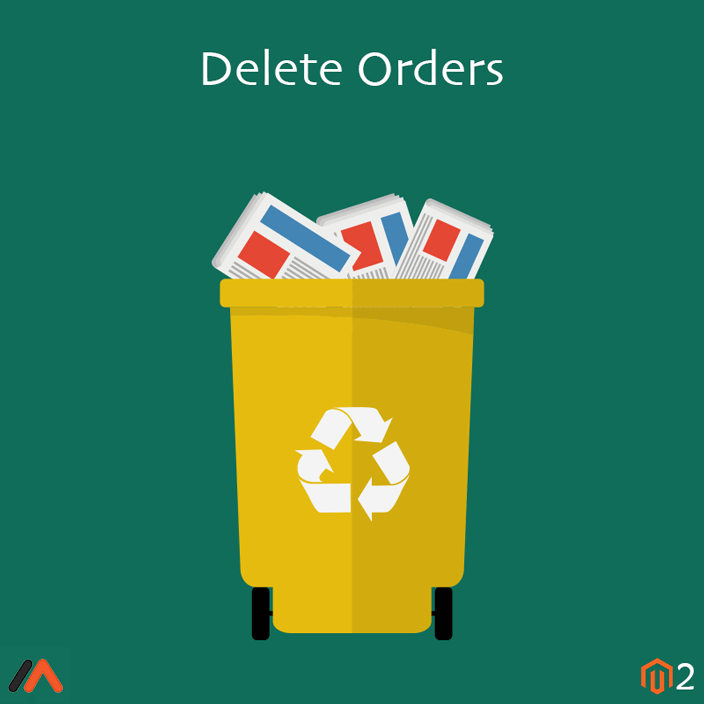 Magento 2 Delete order extension will do this for you, it will delete all the canceled, test, closed and other such undesirable orders along with order details like an invoice, shipments, credit memos, etc. •	Allows deleting the single or specific order. •	Allows deletion of orders from specific data range. •	Dispose of all linked data such as invoice shipments, credit memos, etc. without any extra effort. •	Delete orders in bulk from customer groups. 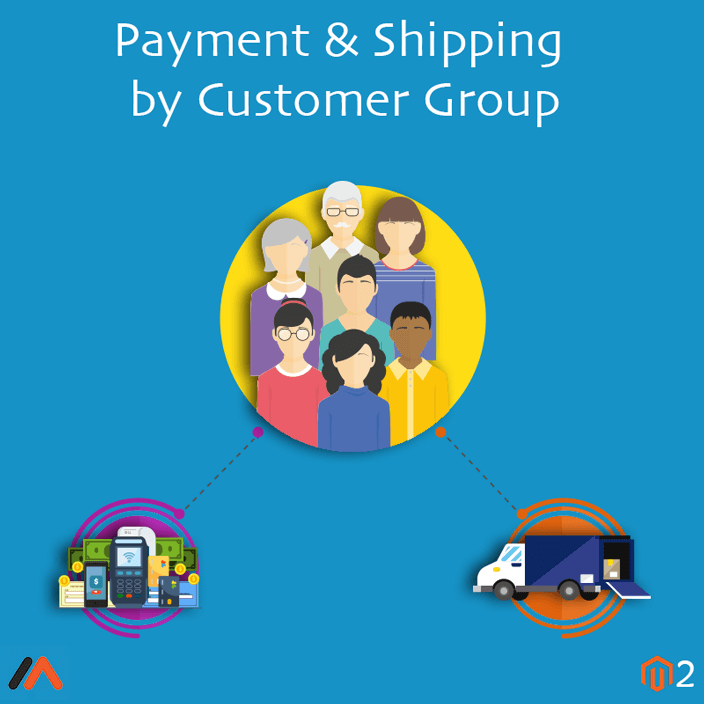 Meetanshi’s Magento 2 Payment & Shipping by Customer Group helps customize your shipping and payment methods based on customer groups. Save yourself from the embarrassment where you have to deny a special shipping or payment facility to your customer after the order is placed with Magento 2 Payment & Shipping By Customer Group. •	Create customer groups according to their types as you want. Assign the shipping and payment methods to those group which will be available to them. •	The customers can see those shipping and payment methods assigned to their groups only. •	Getting better shipping and payment options will encourage customers to perform conversions like registration or getting premium memberships, etc. Meetanshi’s Magento 2 Shipping Table Rates extension lets you configure custom shipping methods and create a flexible system of table rates of your store. Customers will be facilitated with a number of shipping options at your stores. The customer will select the best-suited option for easy and fast delivery, and the store will be benefitted. However, to manage to calculate accurate shipping price based on shipping address, product type, price, etc. can be tough without Meetanshi’s Magento 2 Shipping Table Rates extension. The extension calculates it through CSV file and thus helps to build a flexible table rate system for your store. •	Create n number of shipping methods to fulfill any particular requirements . 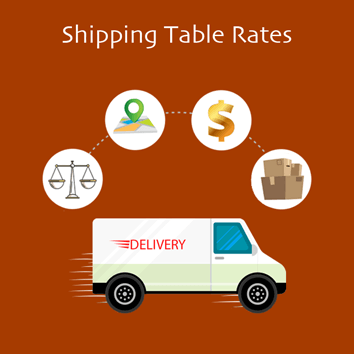 •	Define table rates in bulk through uploading CSV having Shipping Rates. •	Display estimated delivery dates. Mention a delivery interval for every shipping method on the cart page to let customers know how much time the shipping takes before they place the order. •	Use different types of table rates, i.e., either percent or flat rates. •	It allows setting different shipping types for individual products or product groups. For example, you can charge highly for products which are hazardous or stored remotely. •	Set rates based on shipping attributes like destination, price, weight, quantity or their combination too. 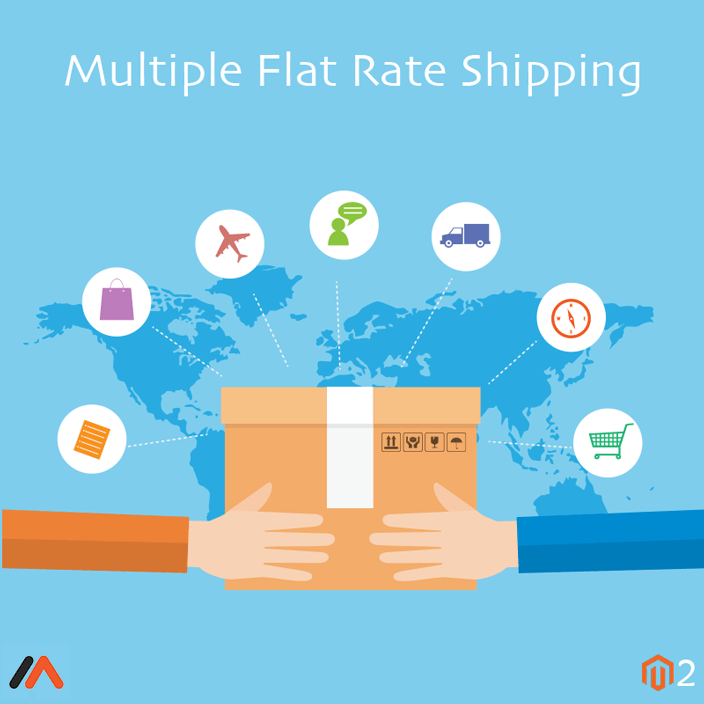 •	Not only sum up rates but also assign minimum or maximum shipping rates to entire orders with multiple items. •	Exclude virtual product types from shipping rates calculations.